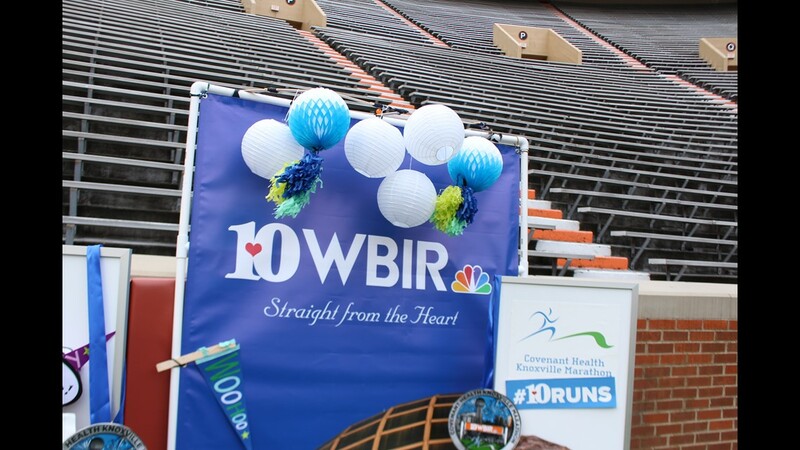 Keep track of all the action right here and watch live coverage on WBIR Channel 10. 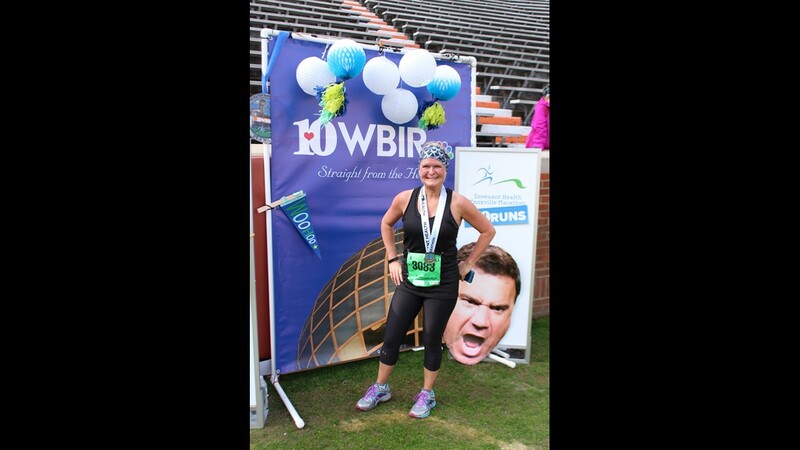 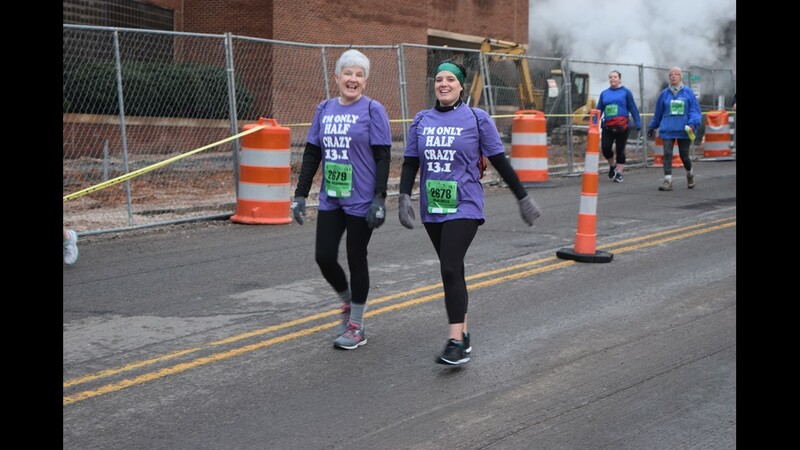 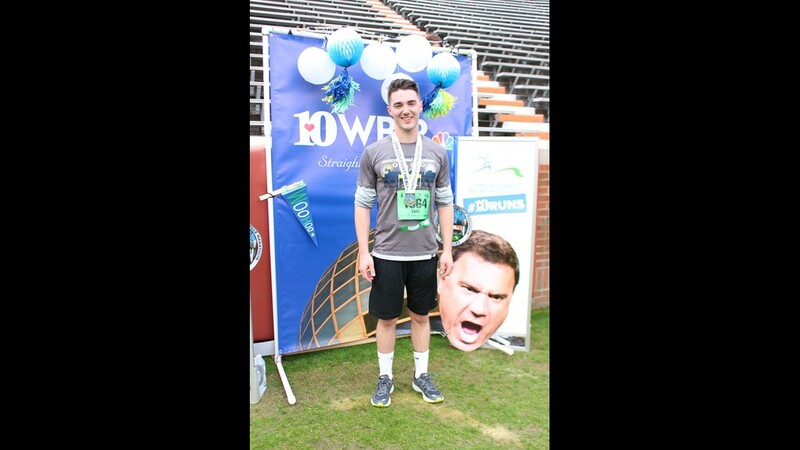 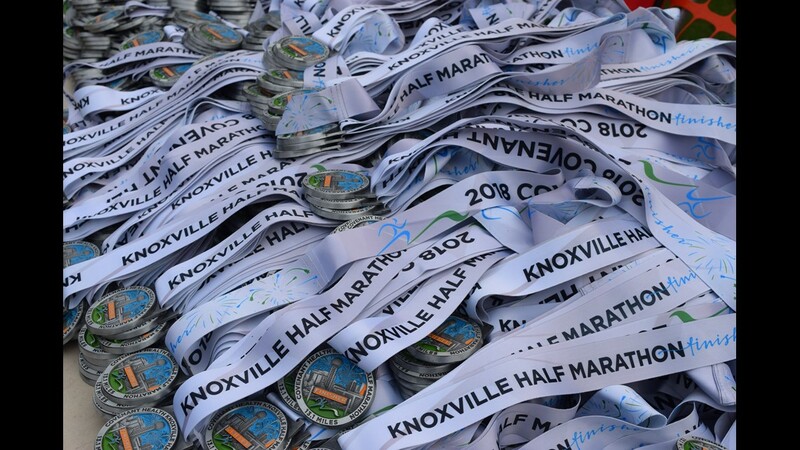 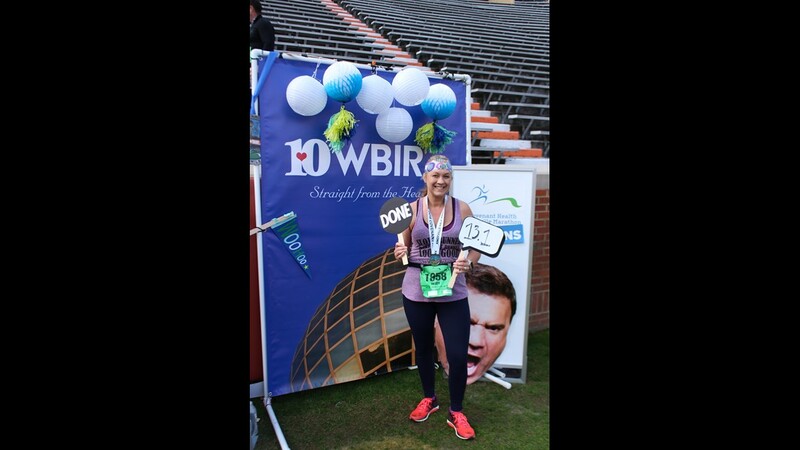 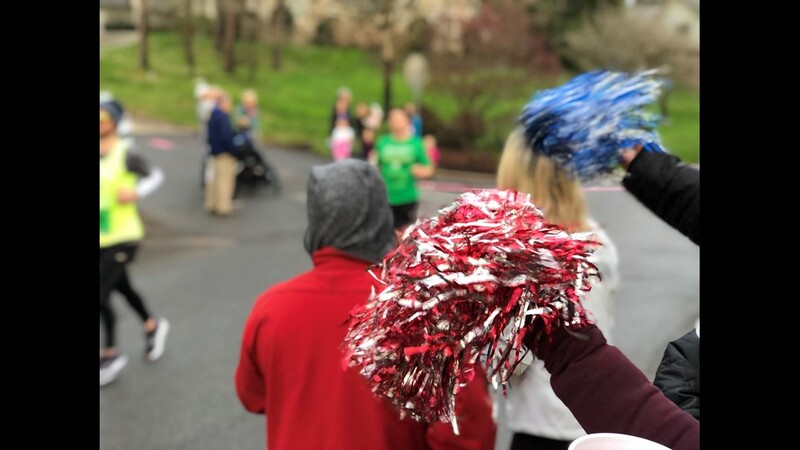 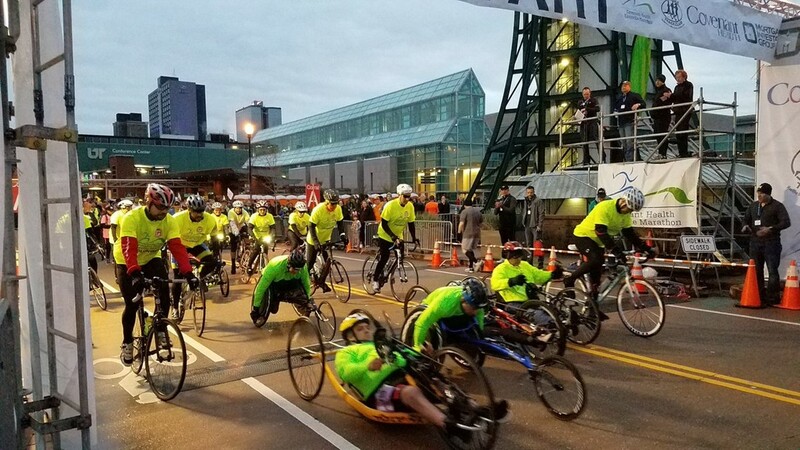 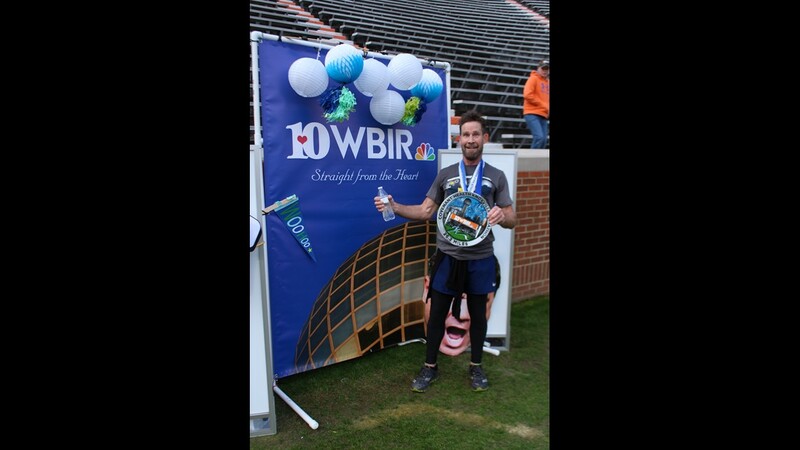 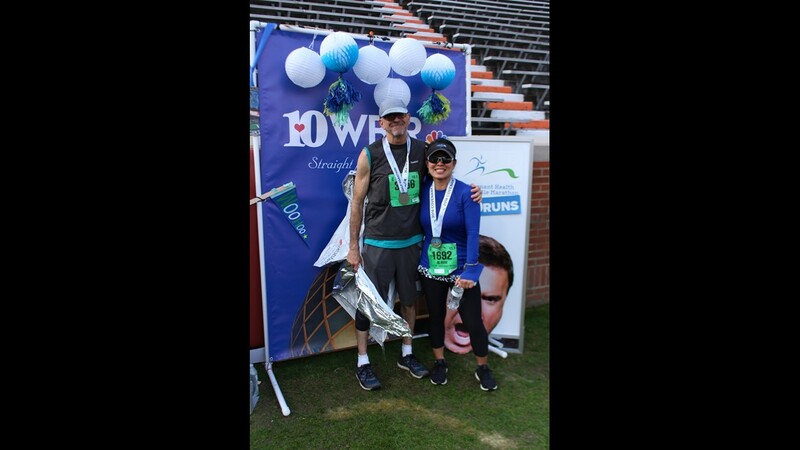 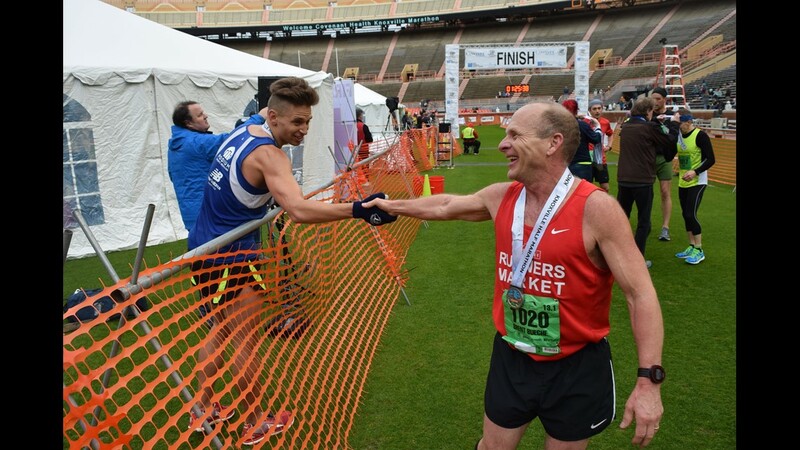 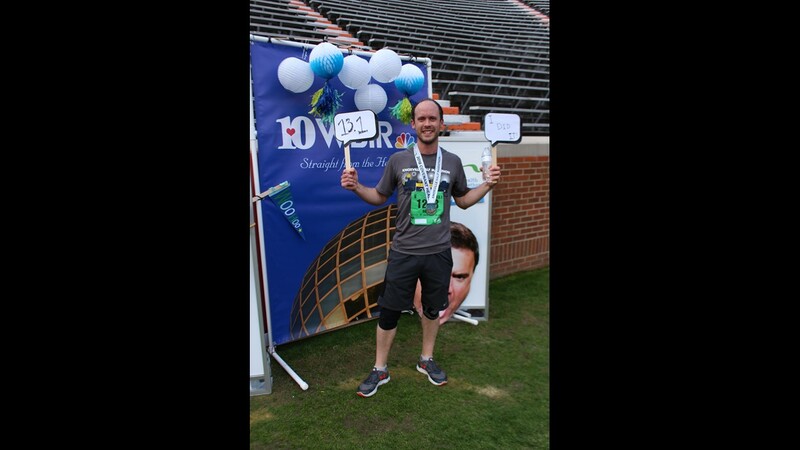 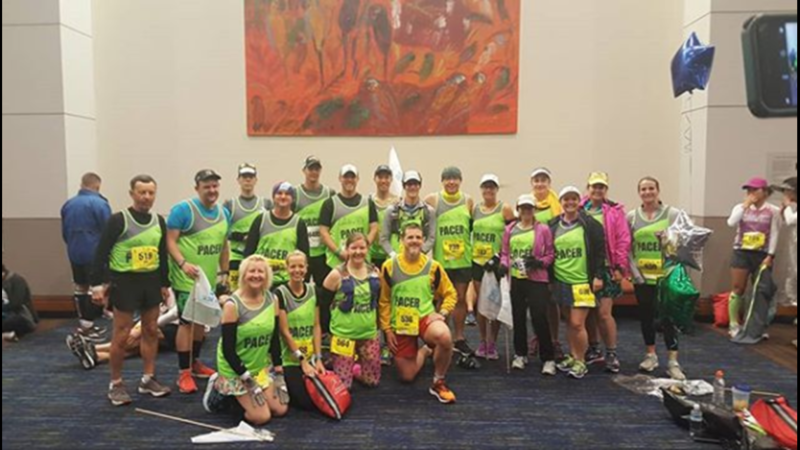 Thousands of people put their training to the ultimate test in the 2018 Covenant Health Knoxville Marathon, and hundreds finished either the half marathon's 13.1-mile long course, or the full marathon's 26.2 grueling miles. 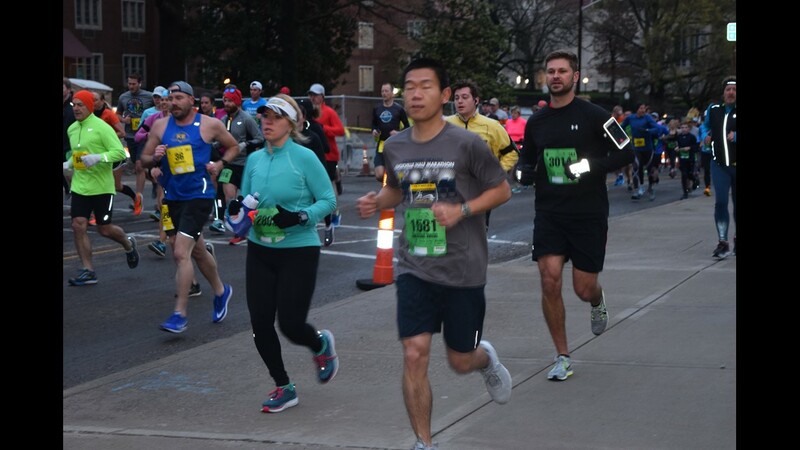 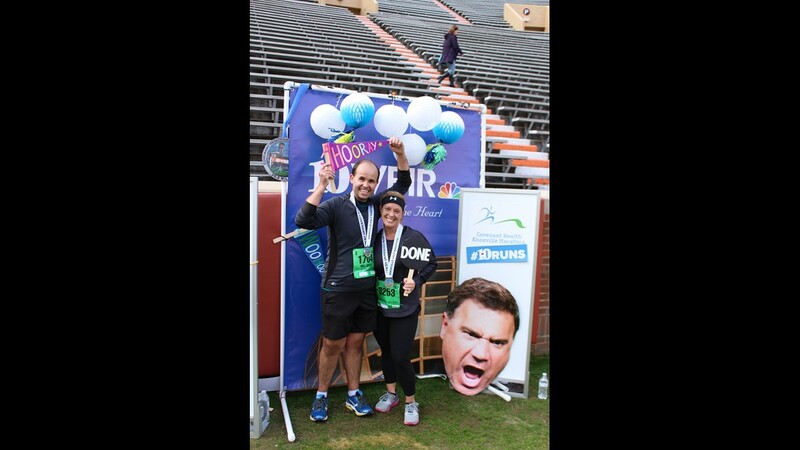 The first to cross the finish line in their respective categories were Christian Thompson and Stephanie Cloutier in the half marathon, and Gina Rouse and Bryan Morseman in the full marathon. 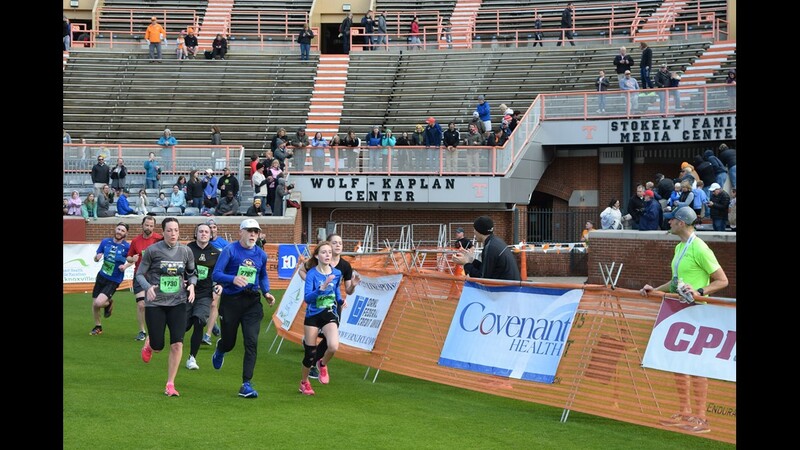 Runners take on a hill during the Covenant Health Knoxville Marathon. 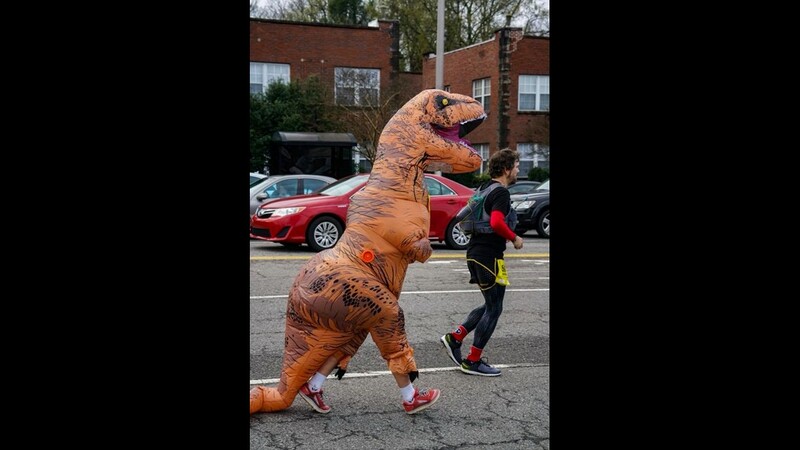 A runner dresses up at a dinosaur. 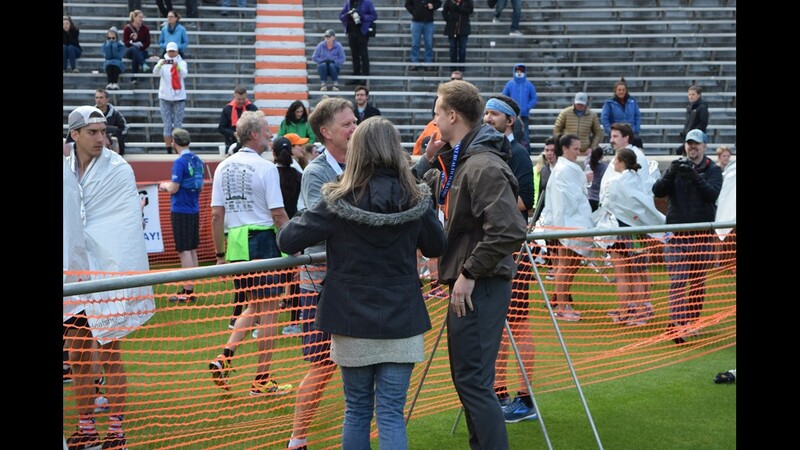 The top 3 half marathon winners of the men's race interview live on 10 News. 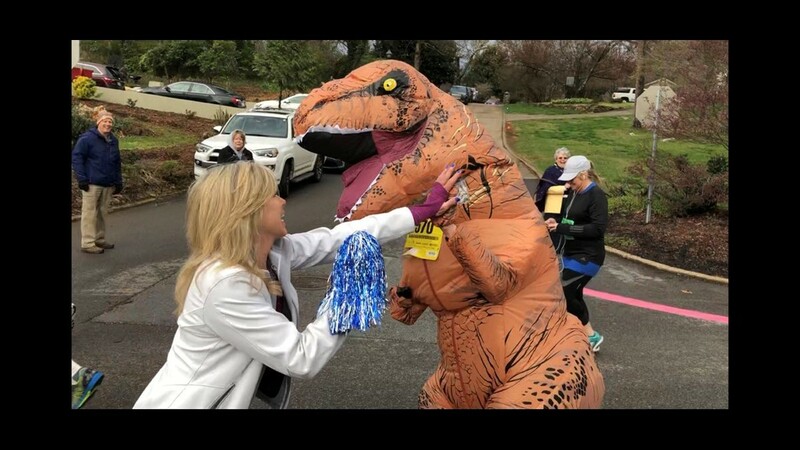 A supporter high fives a runner dressed at a T-Rex. 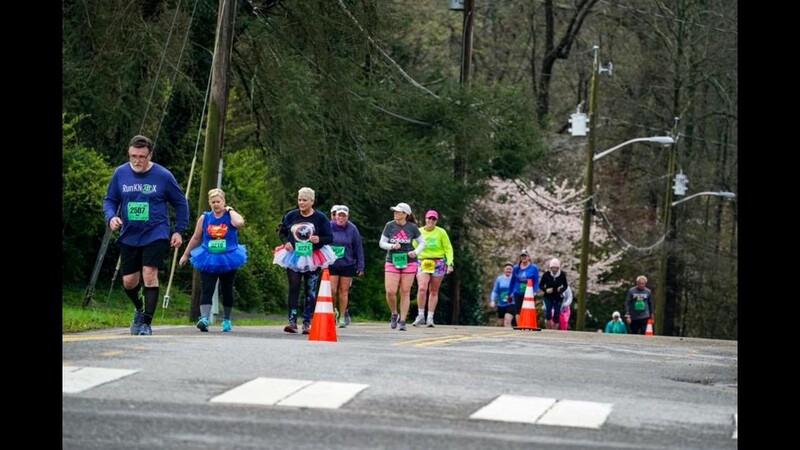 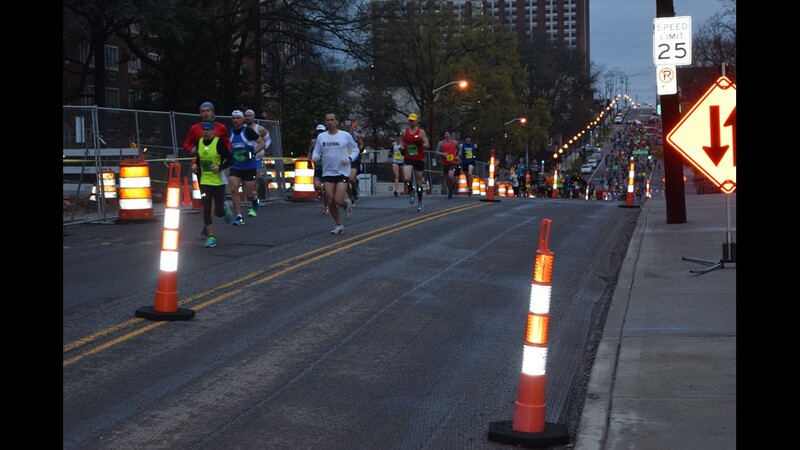 Runners take on a hill in the Covenant Health Knoxville Marathon. 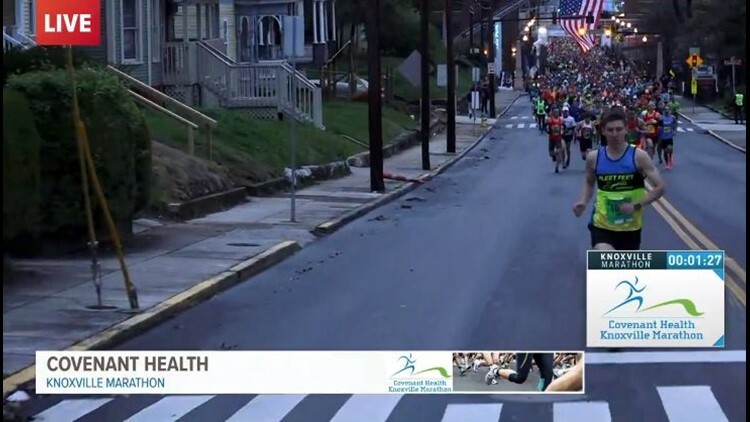 A runner takes the lead in the half marathon. 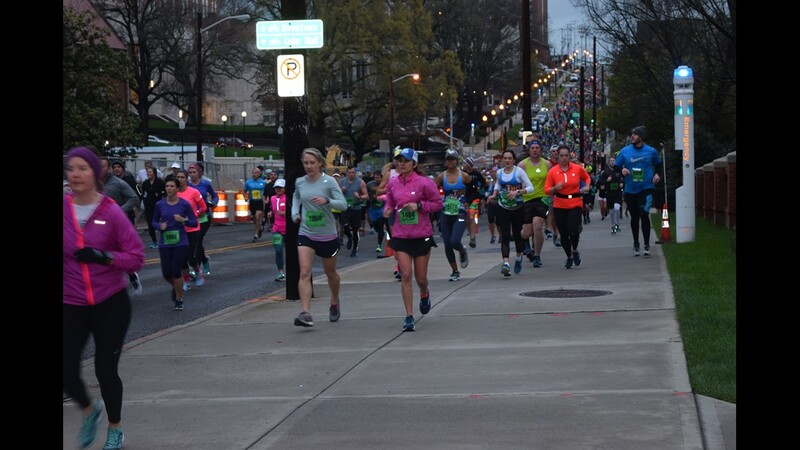 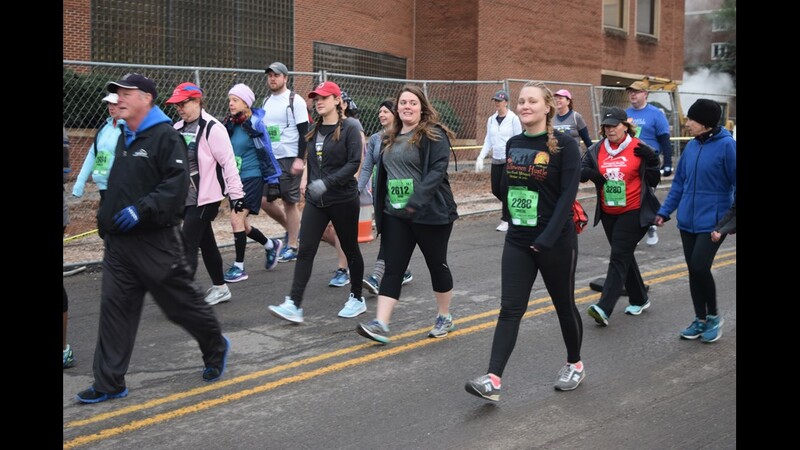 Participants in the Covenant Health Knoxville Marathon get a strong start in the first mile of the race, running and walking down Volunteer Boulevard in the heart of the UT campus. 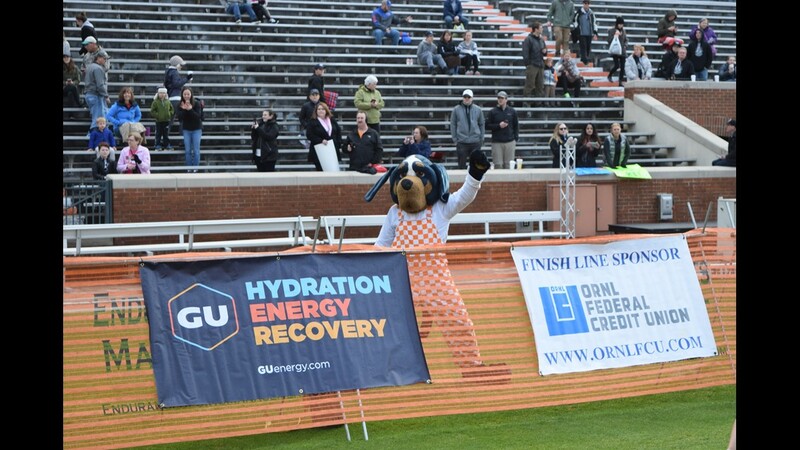 Supporters cheer on the runners in the Covenant Health Knoxville Marathon. 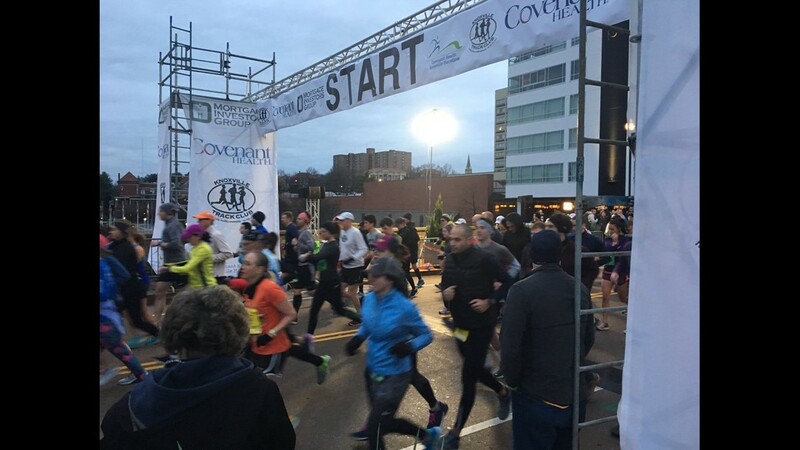 Runners hit the street in the Covenant Health Knoxville Half Marathon. 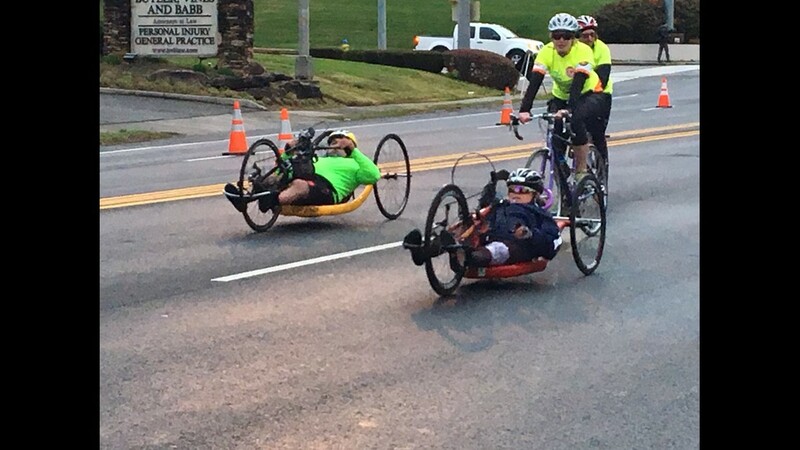 Cyclists move through the Covenant Health Knoxville Marathon. 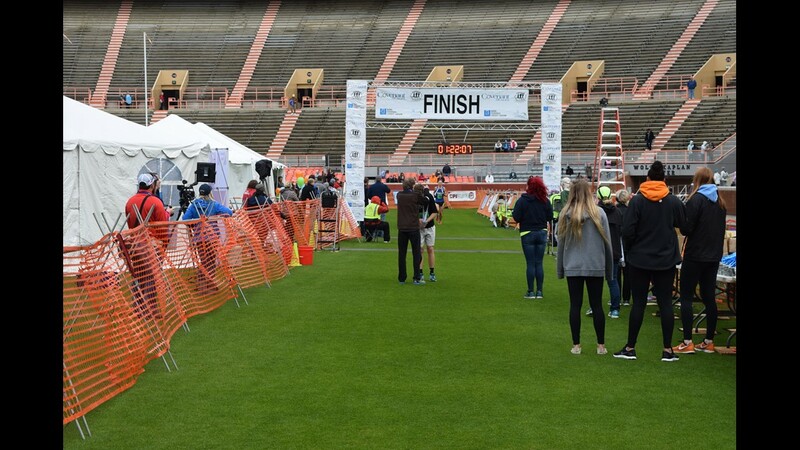 The opening ceremony took place at the start line at World's Fair Park starting around 7:20 a.m. before the race stepped off moments later. 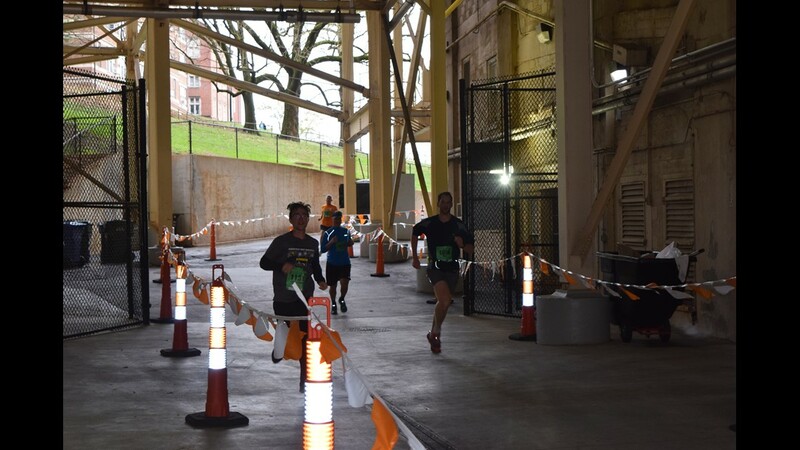 Below are updates as they happened through the race. 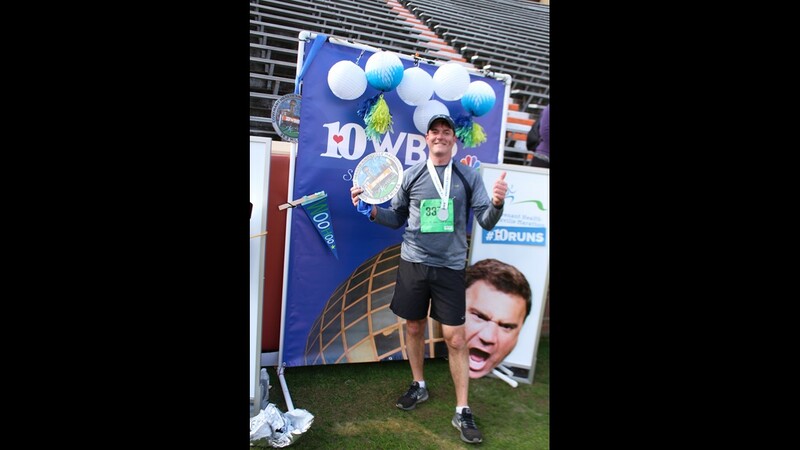 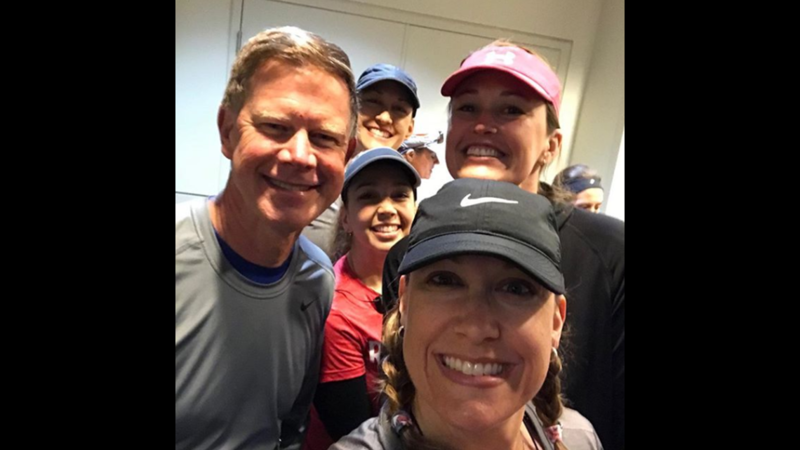 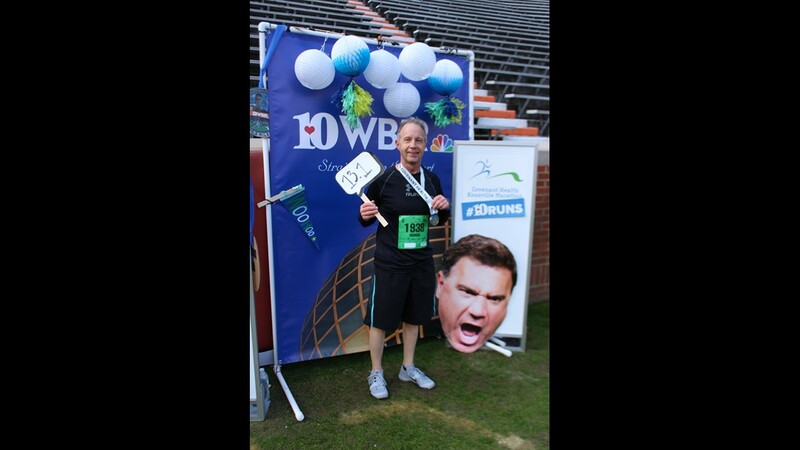 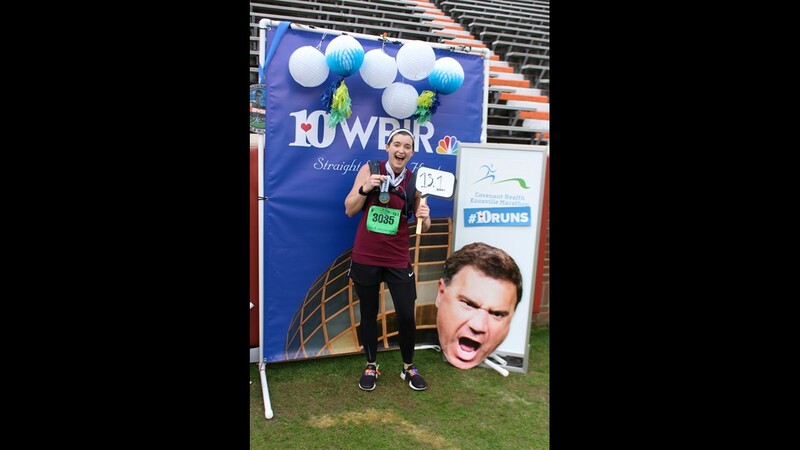 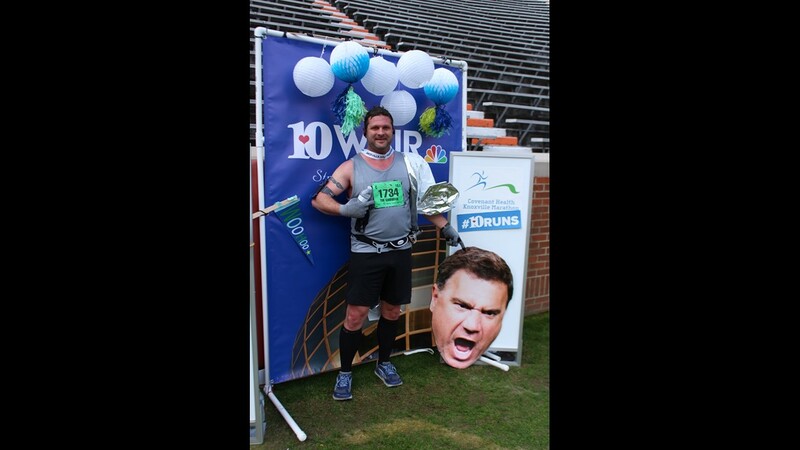 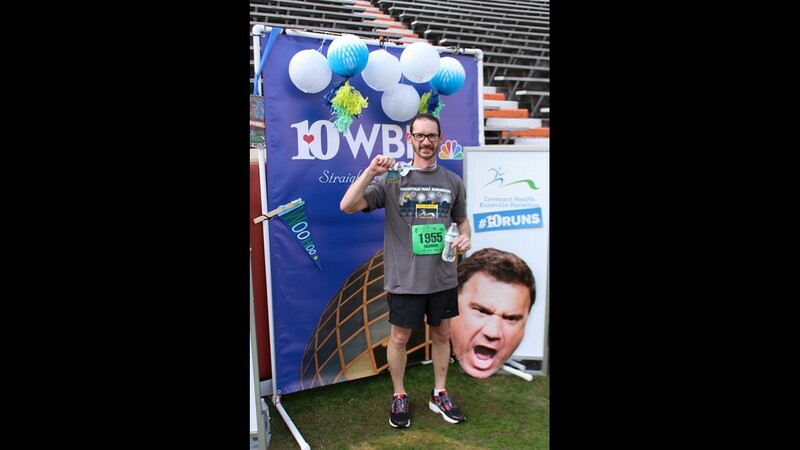 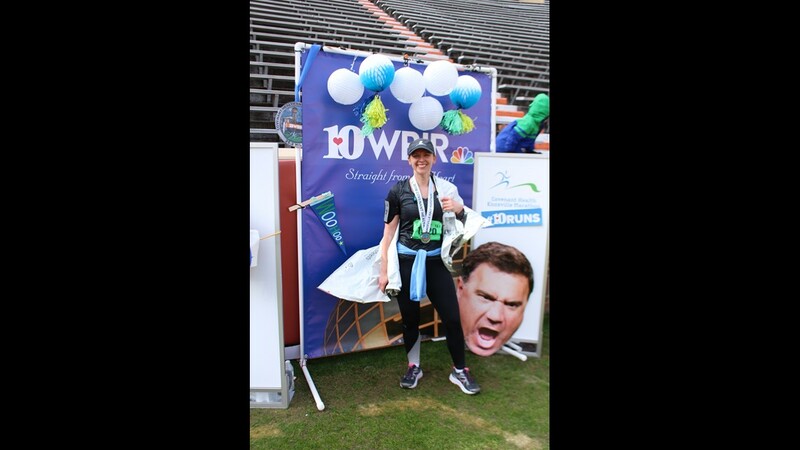 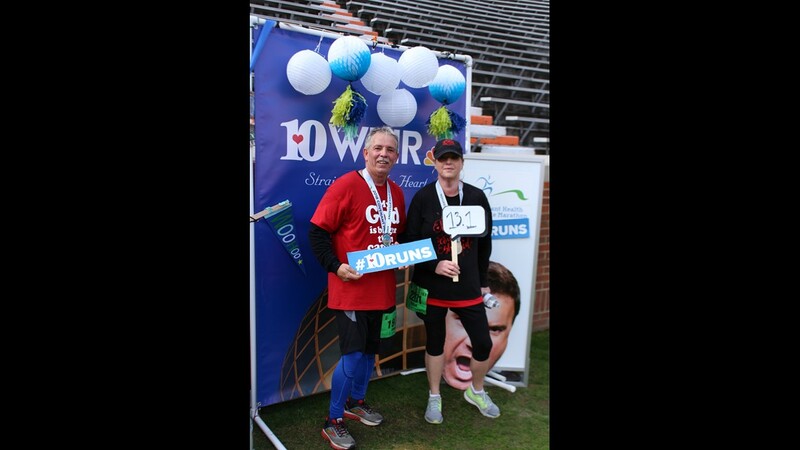 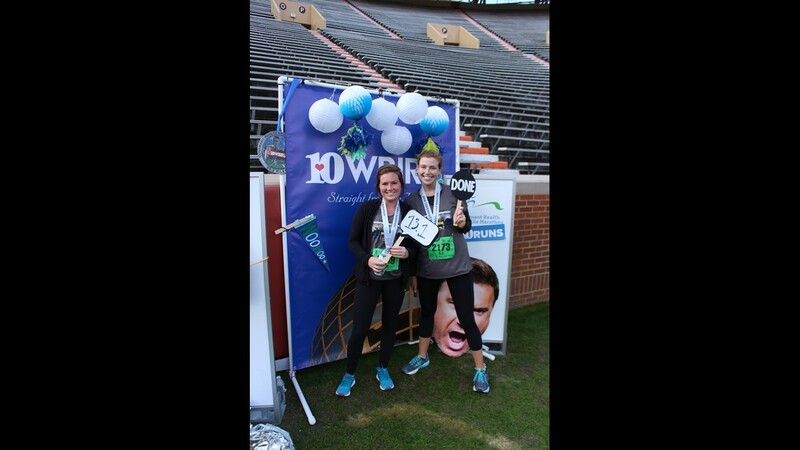 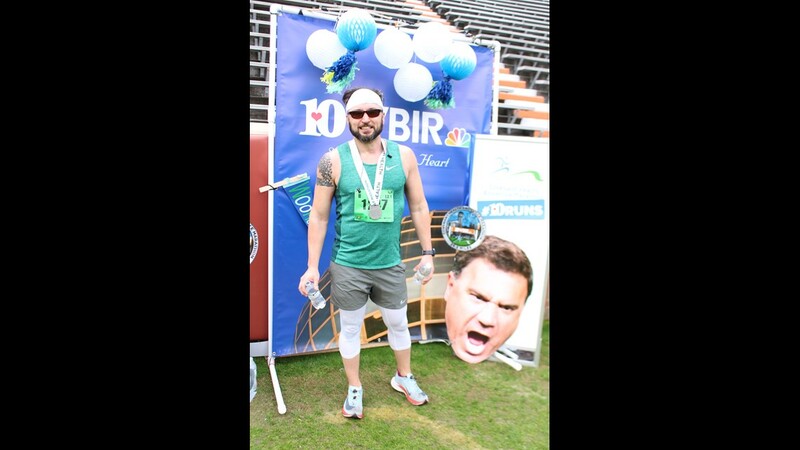 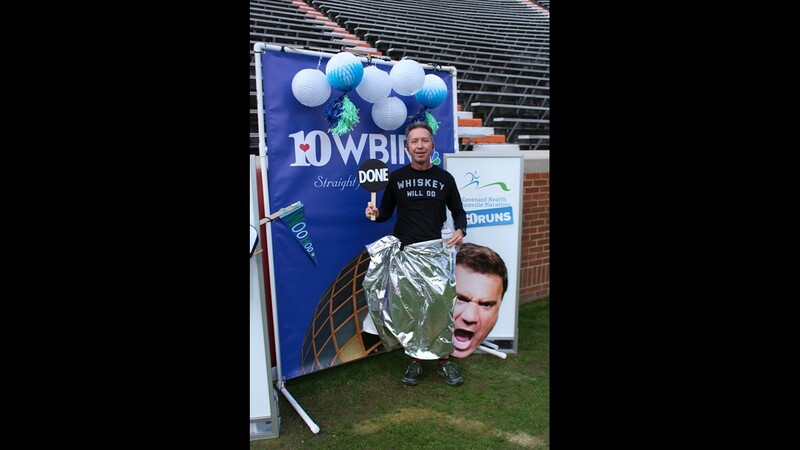 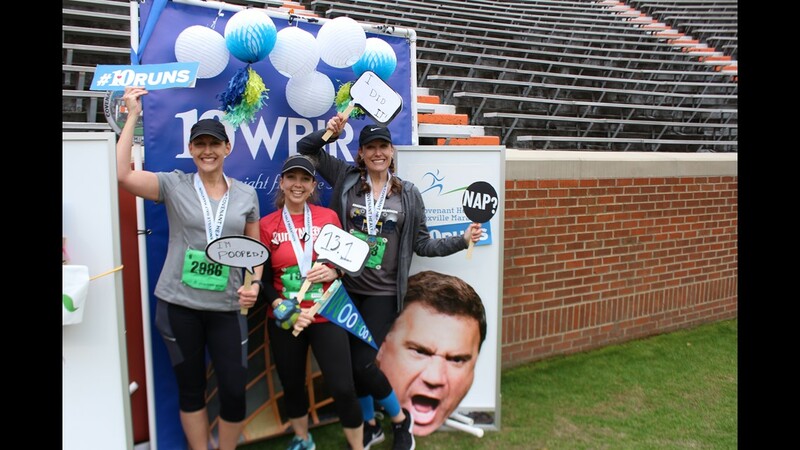 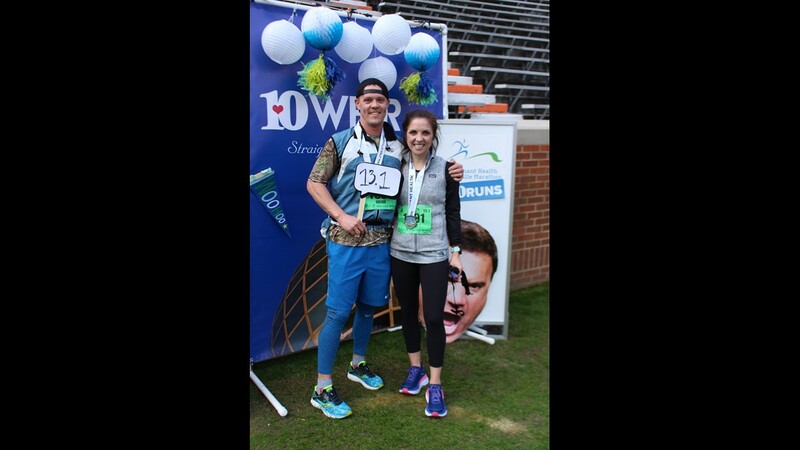 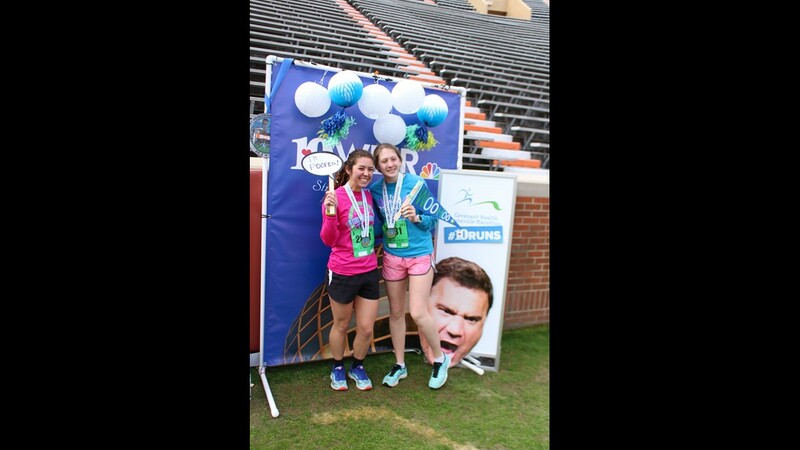 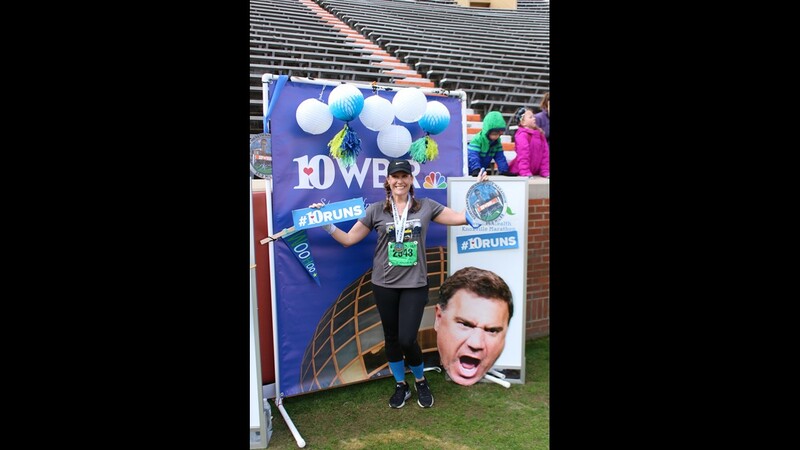 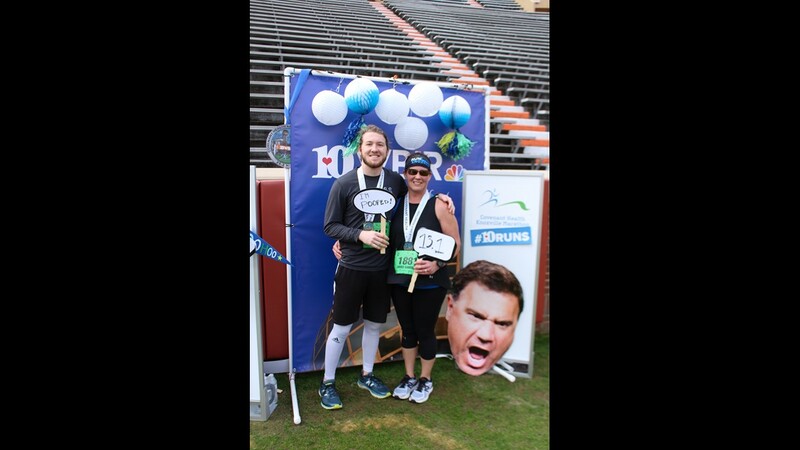 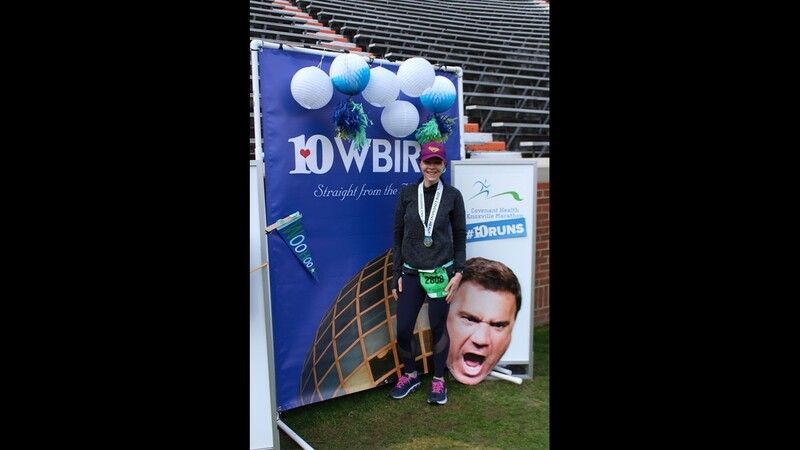 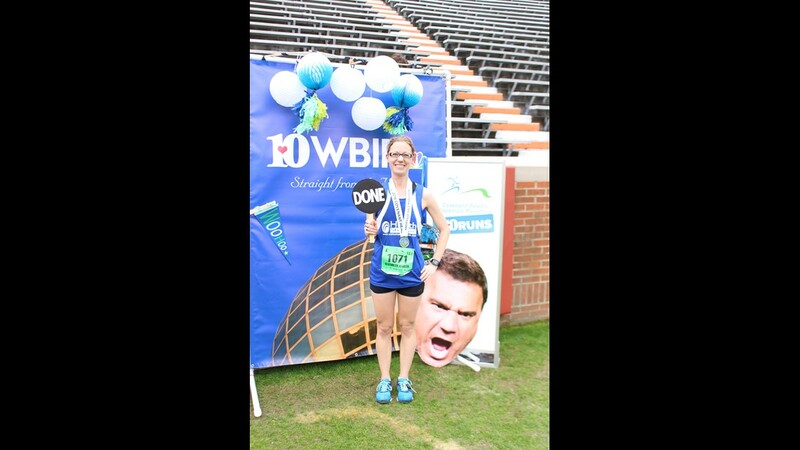 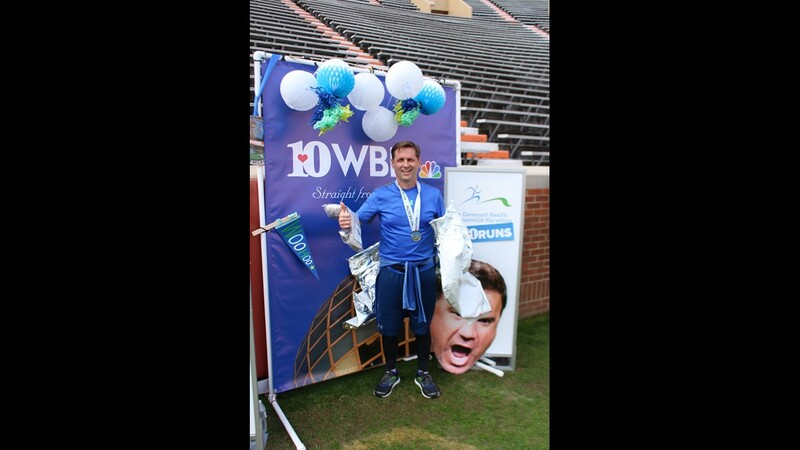 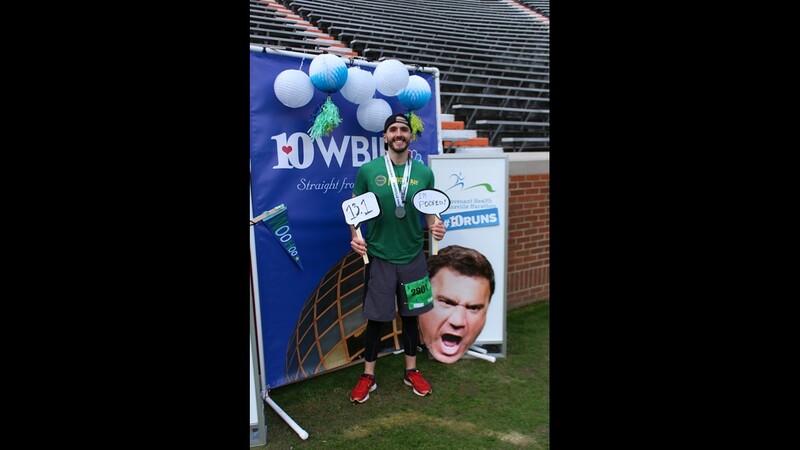 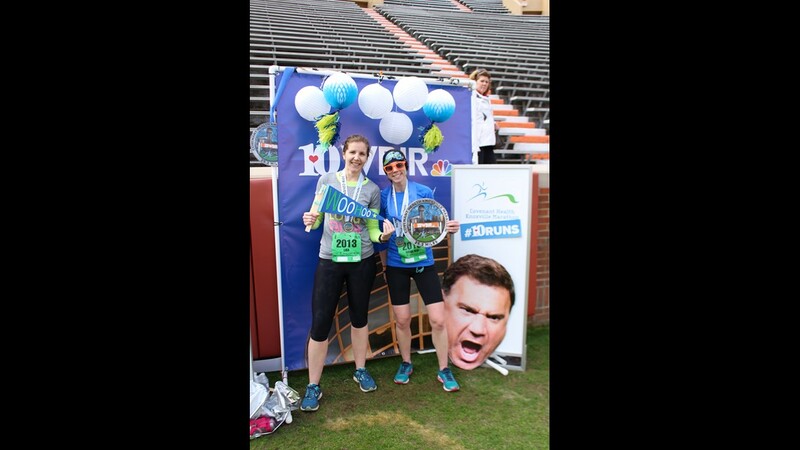 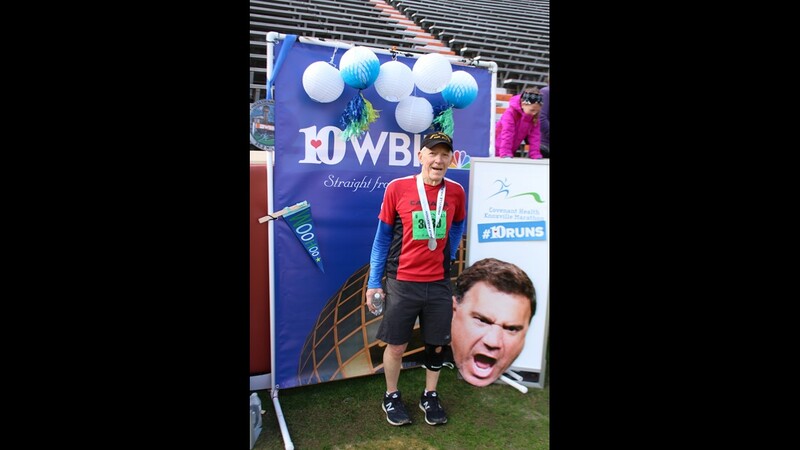 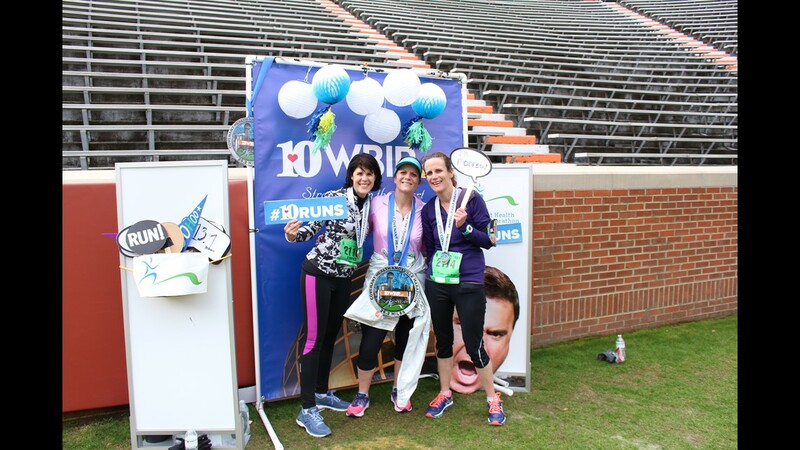 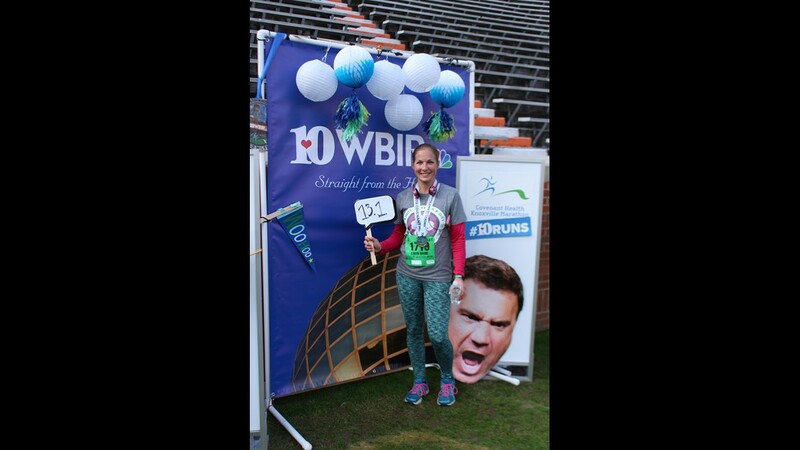 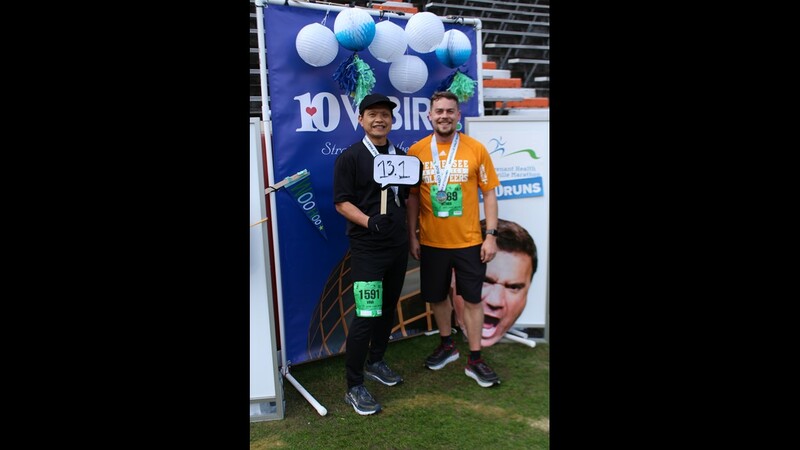 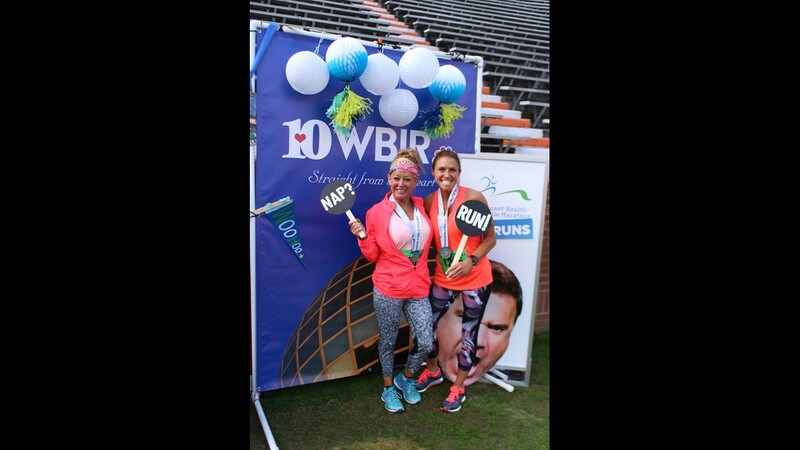 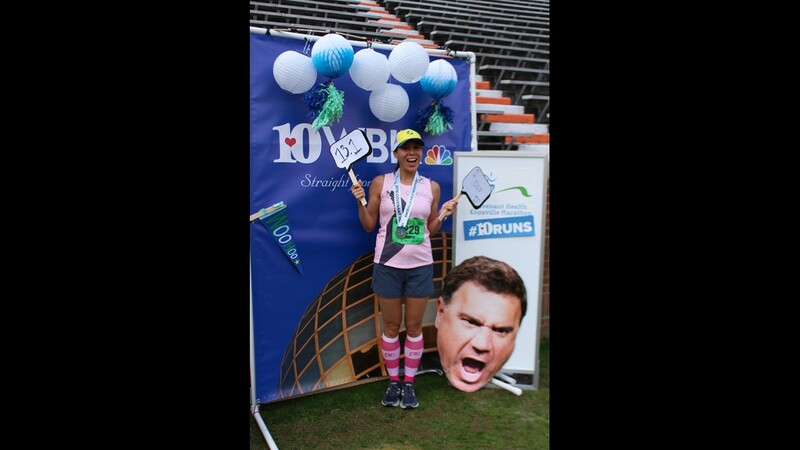 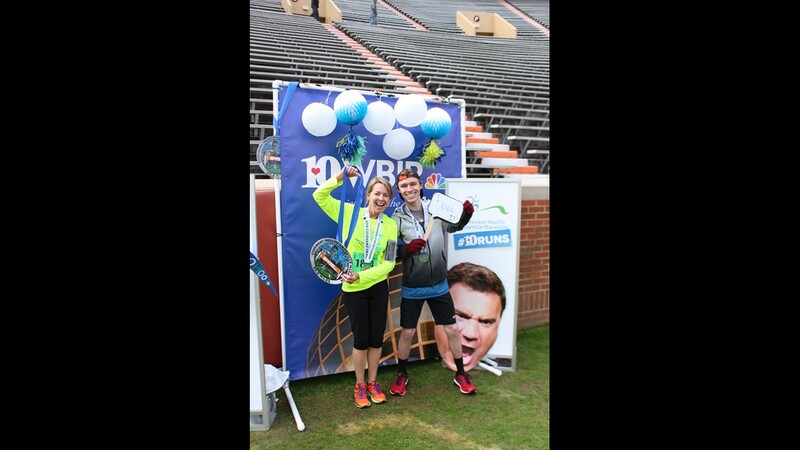 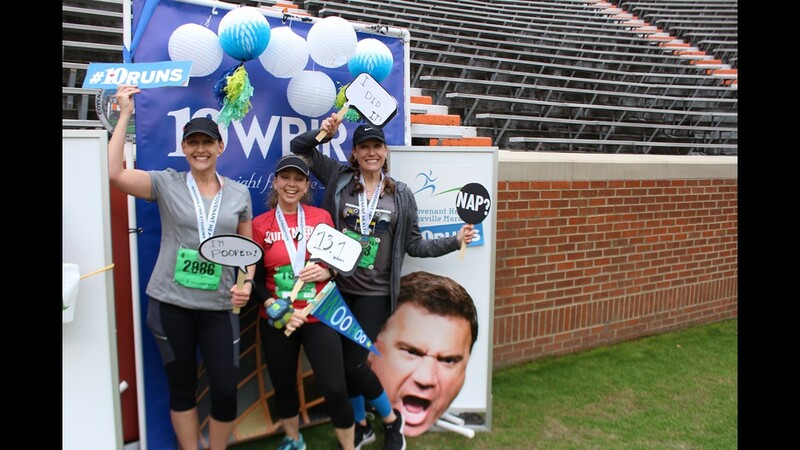 Be sure to send us your marathon pictures using the hashtag #10Runs! 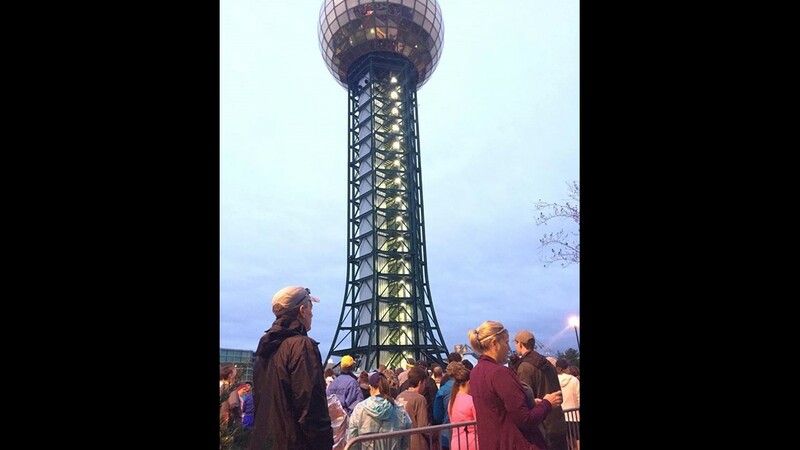 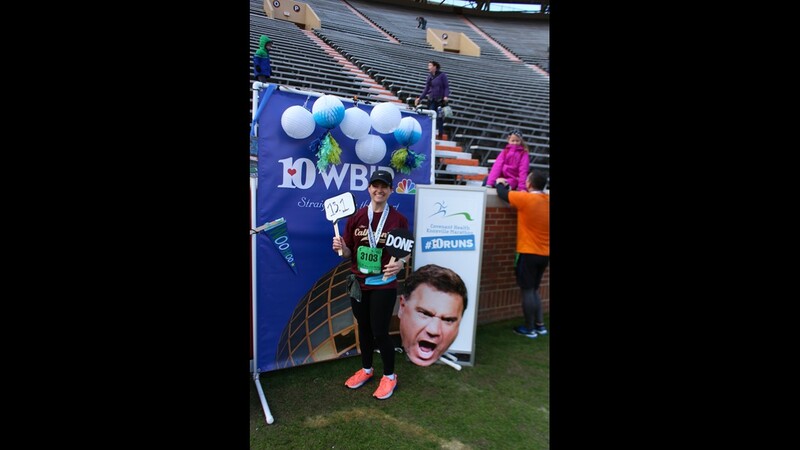 We'll be gathering and posting as many of your photos as possible through the day right here on WBIR.com. 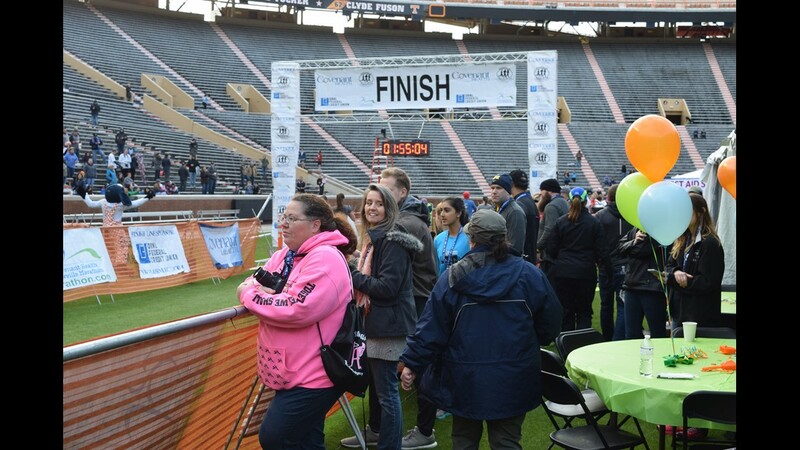 You can check live results of the full marathon by name or bib number at his link as soon as people start crossing the finish line. 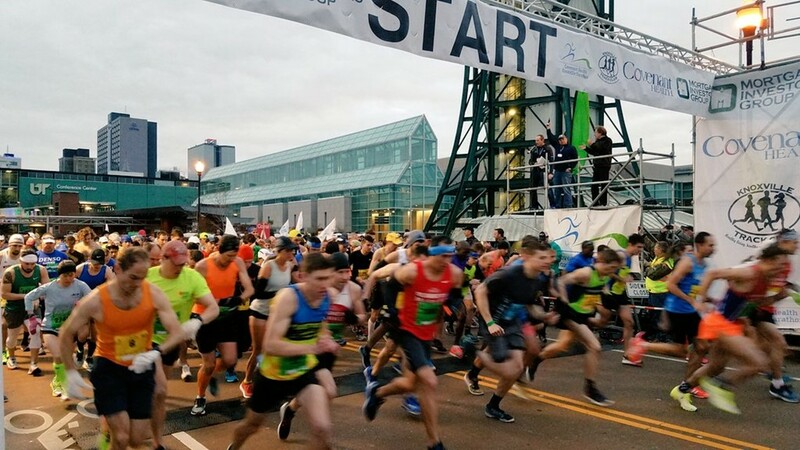 A total of 670 people signed up to run the full marathon this morning, and a whopping 2,308 people will fill the streets of downtown compete in the half marathon. 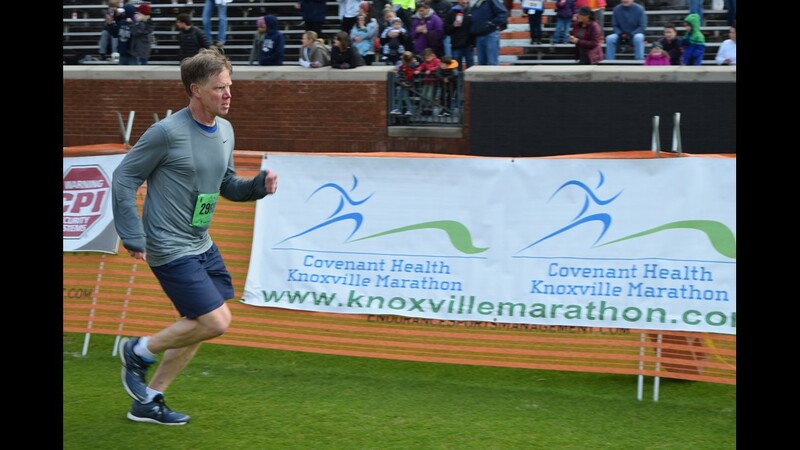 Including the relay races, Saturday's 5K race and the Covenant Kids Run -- more than 8,300 people in all participated this year! 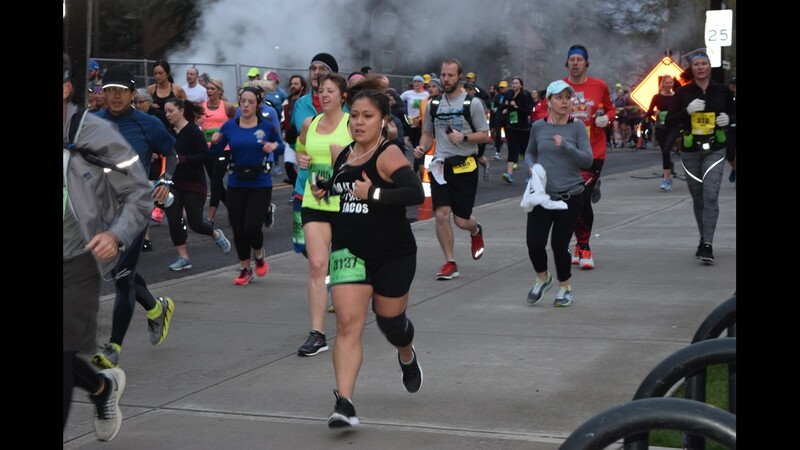 The full marathon is 26.2 miles in total. 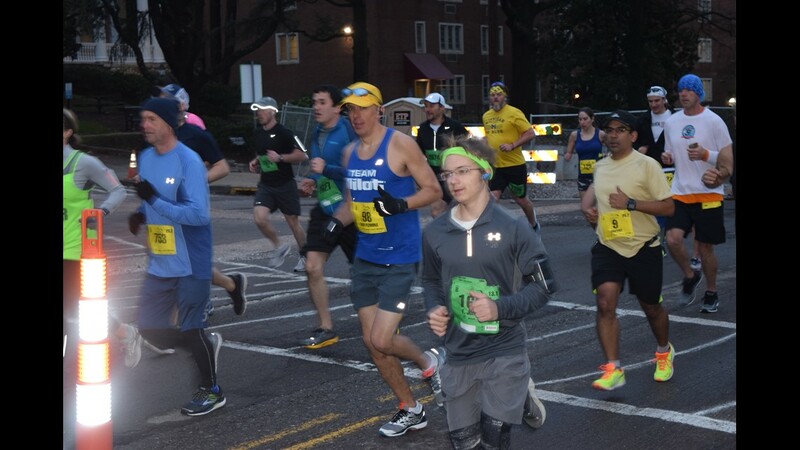 If you were watching -- the full marathon runners were wearing yellow bibs, and the half marathon runners were wearing green bibs. 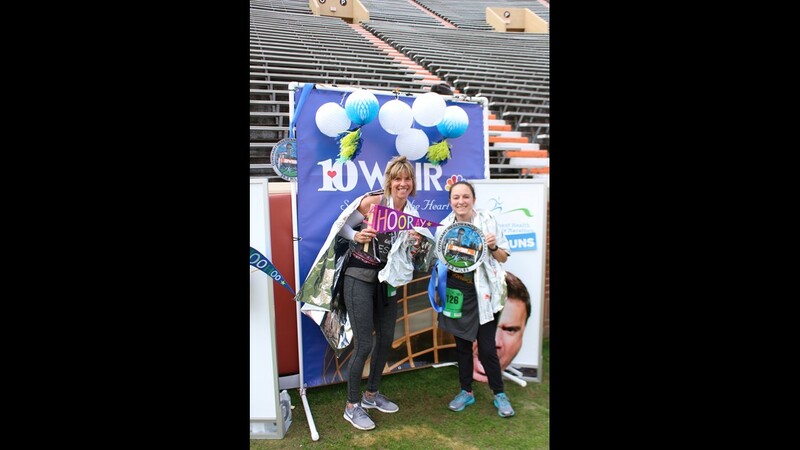 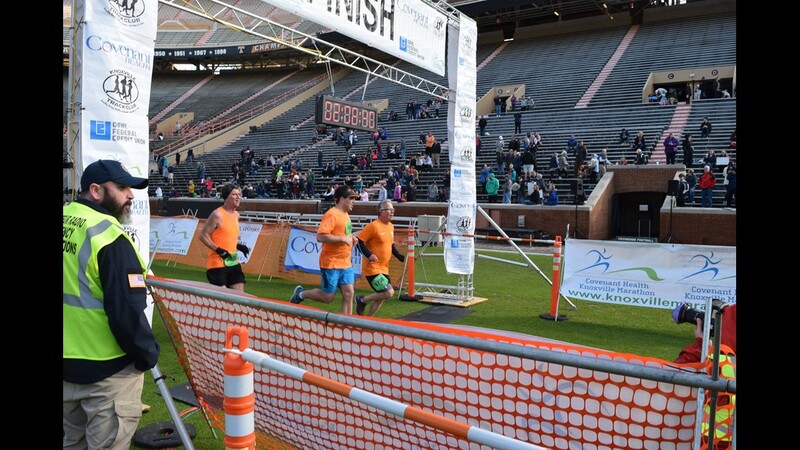 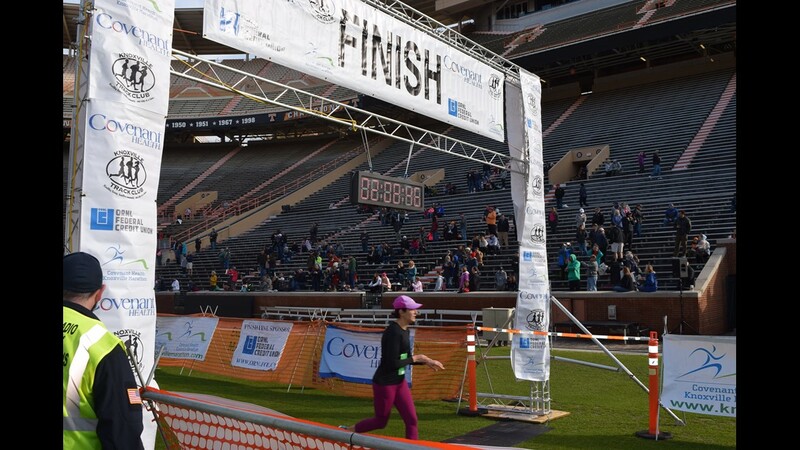 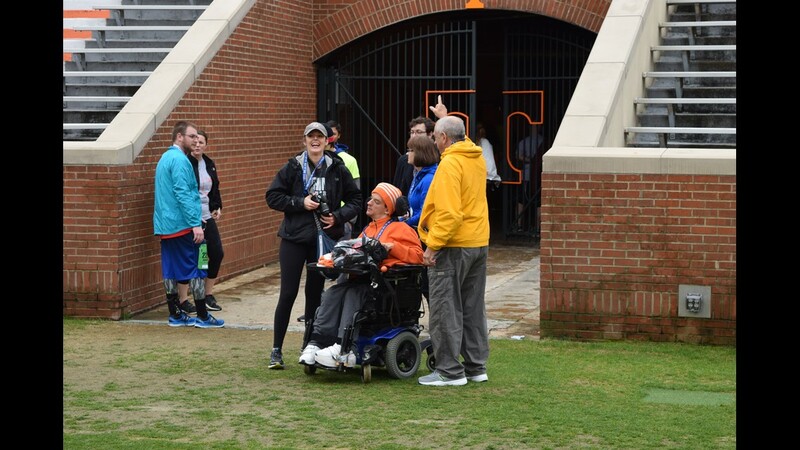 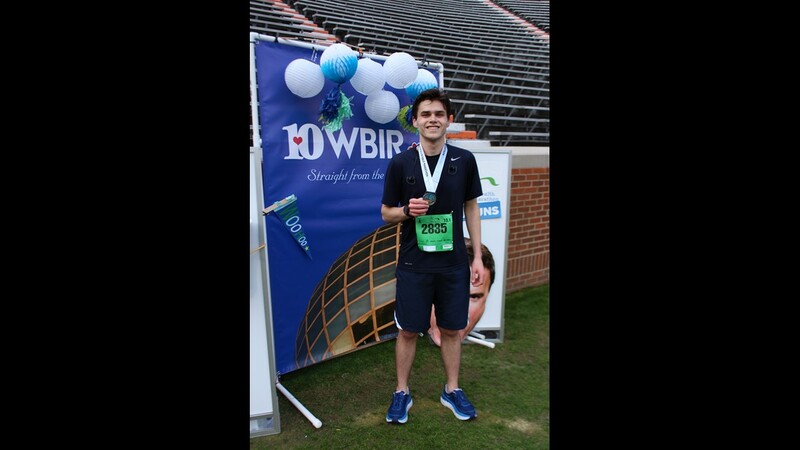 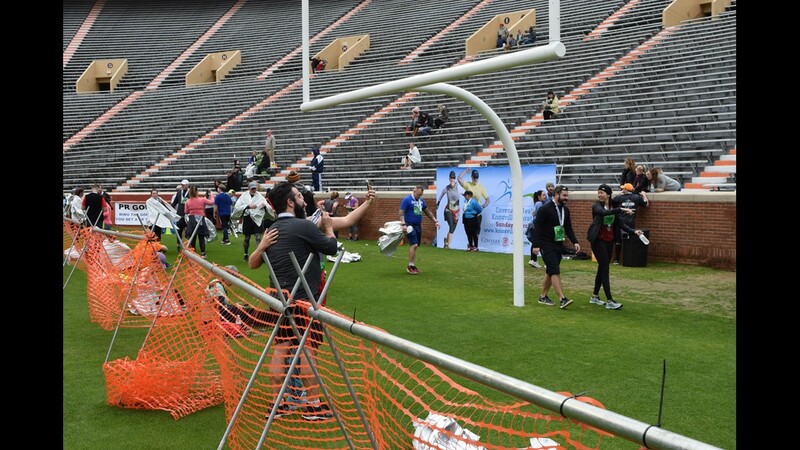 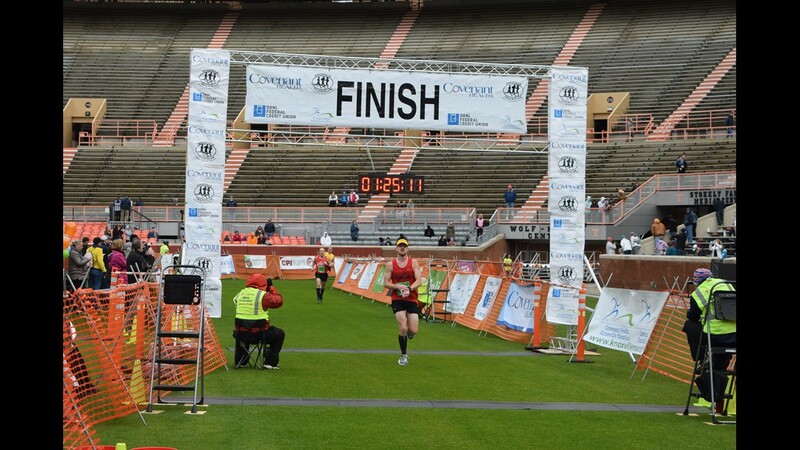 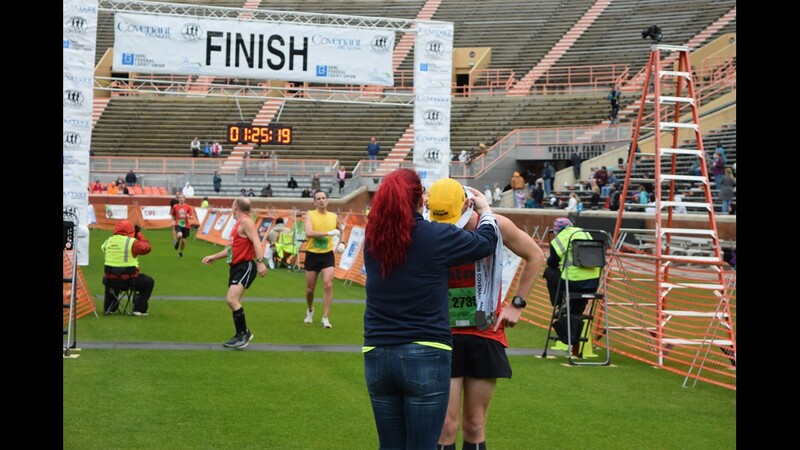 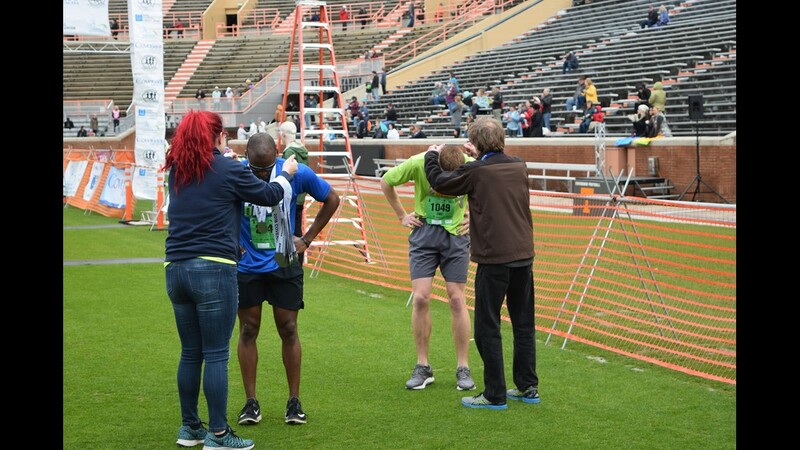 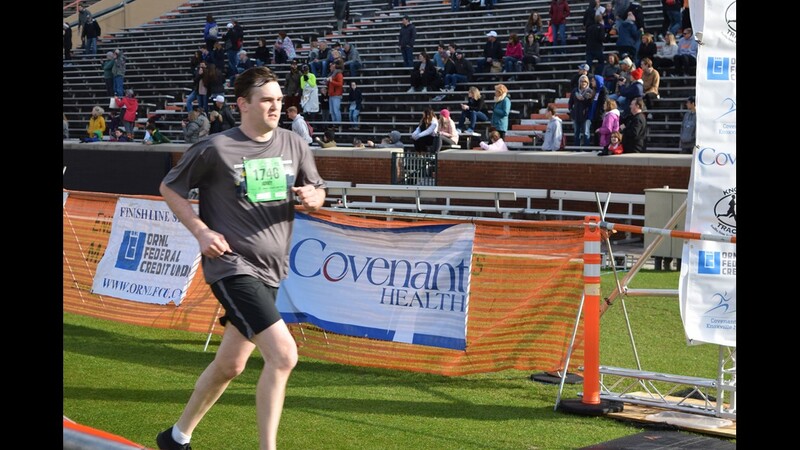 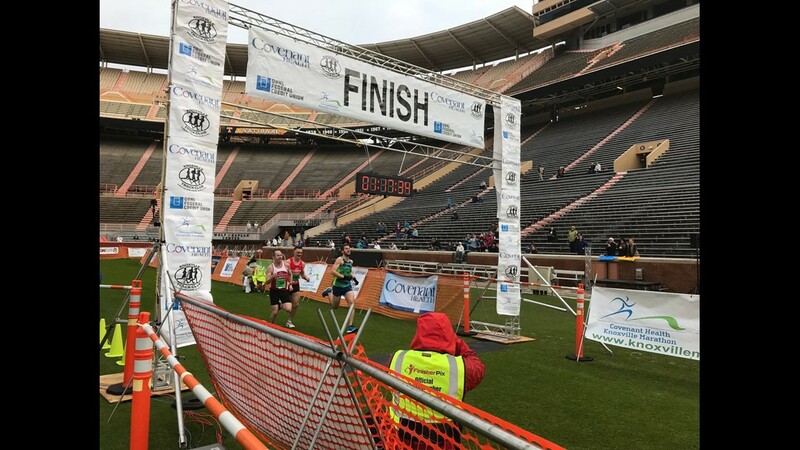 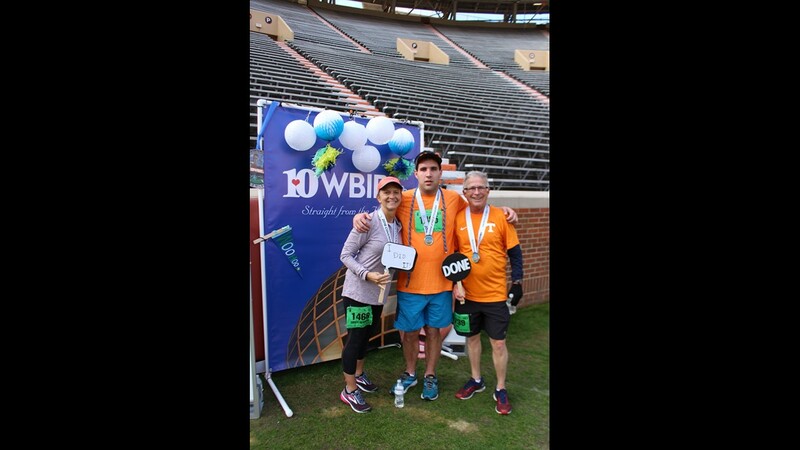 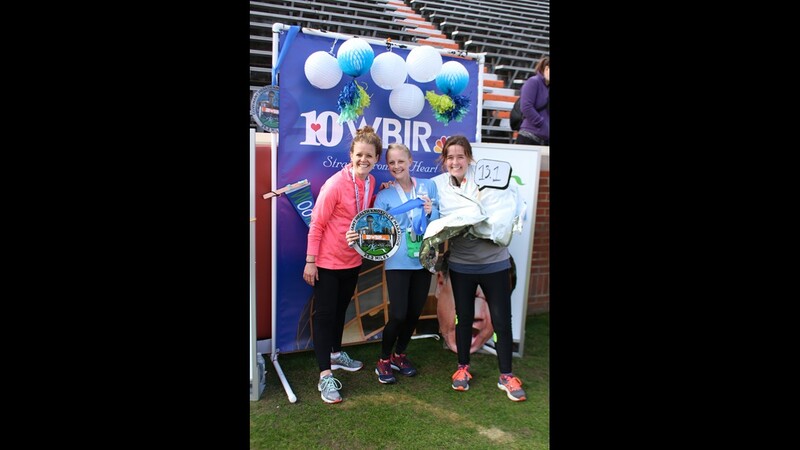 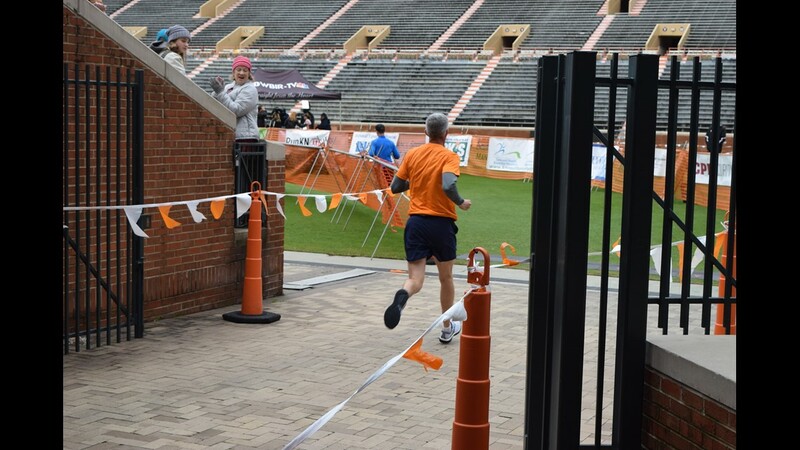 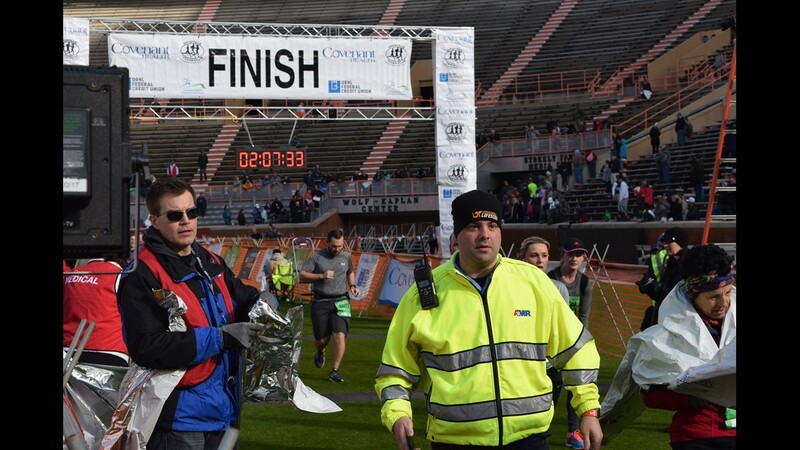 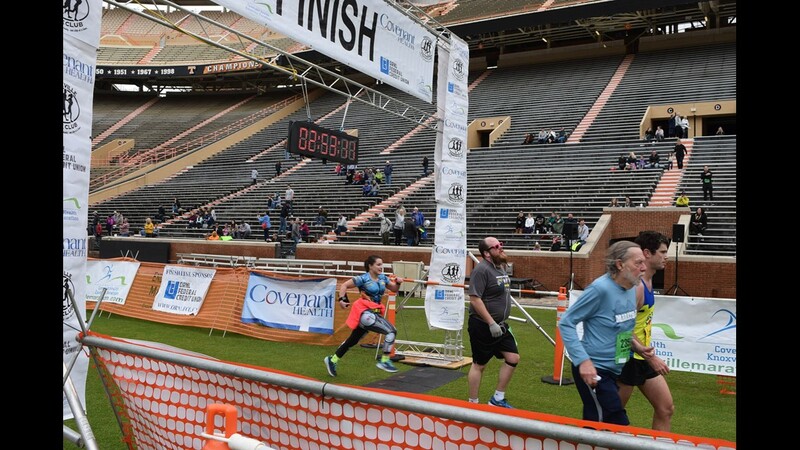 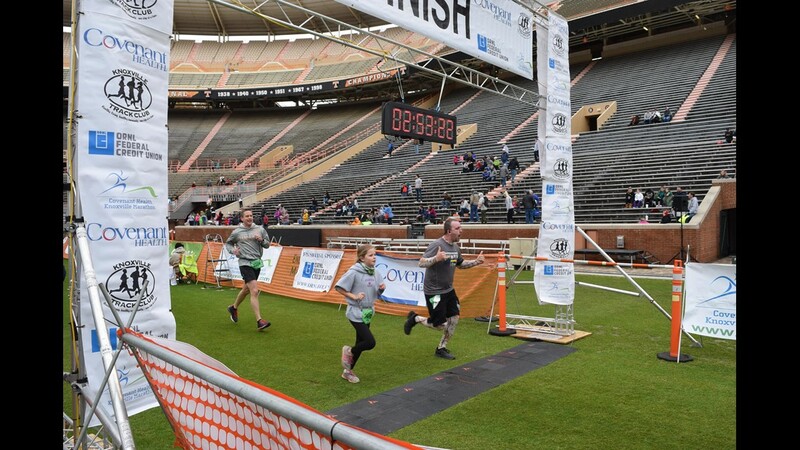 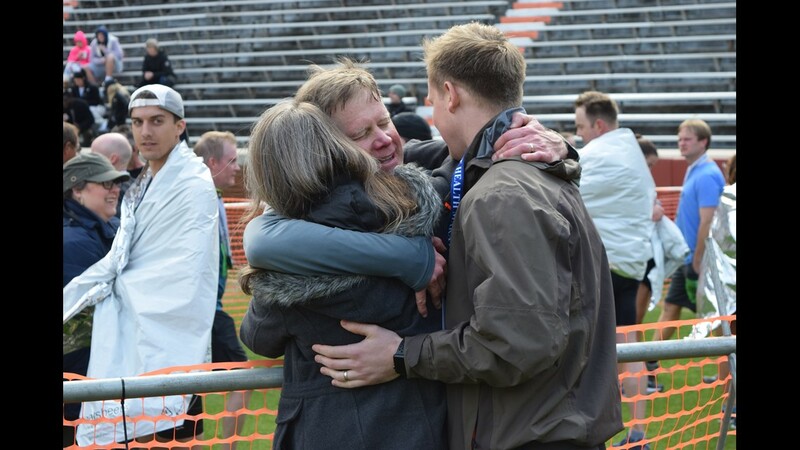 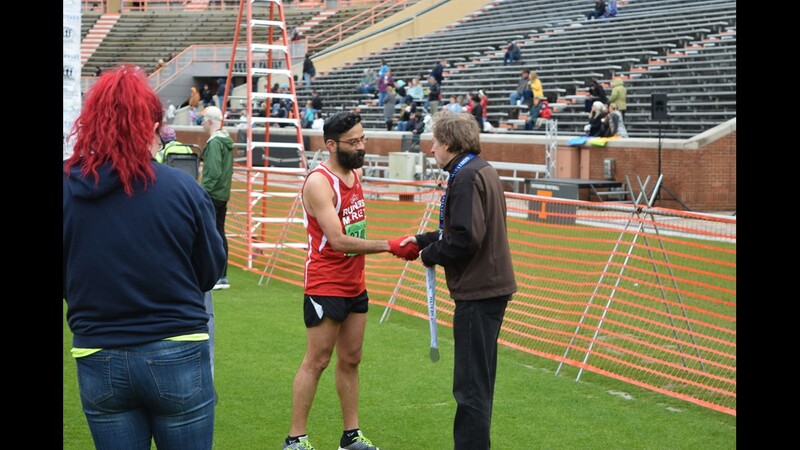 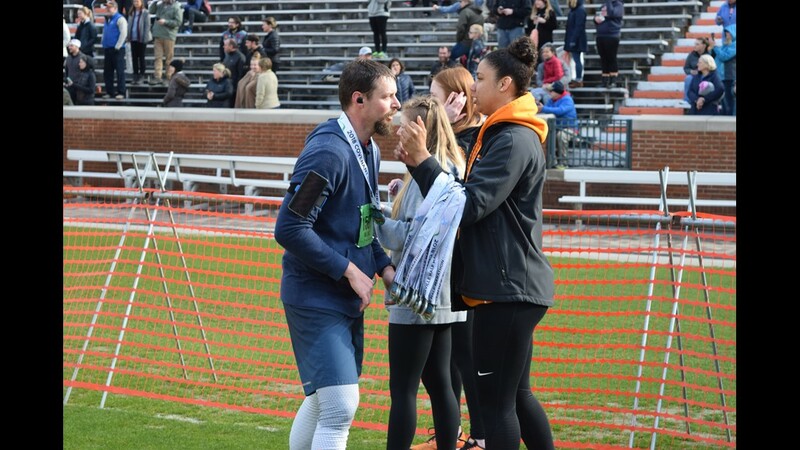 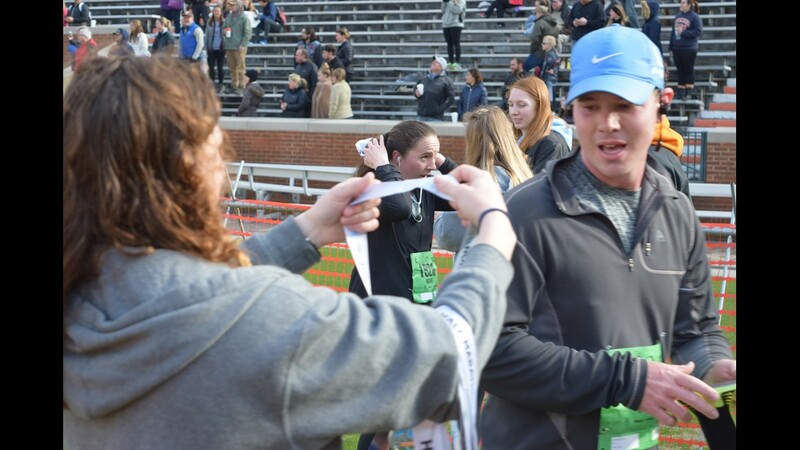 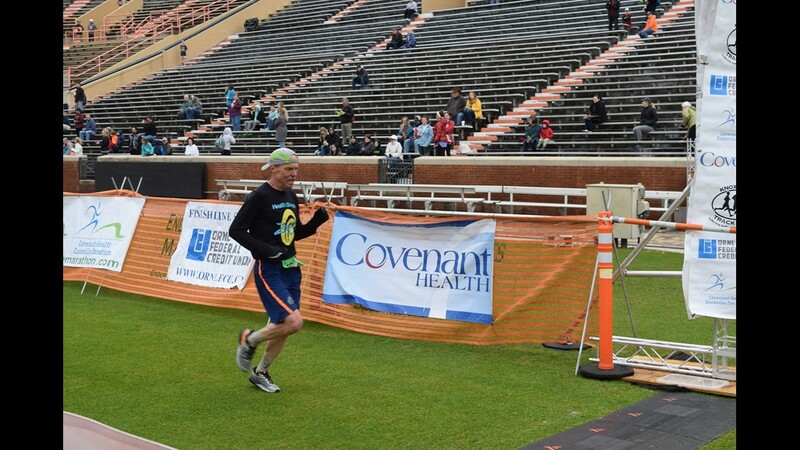 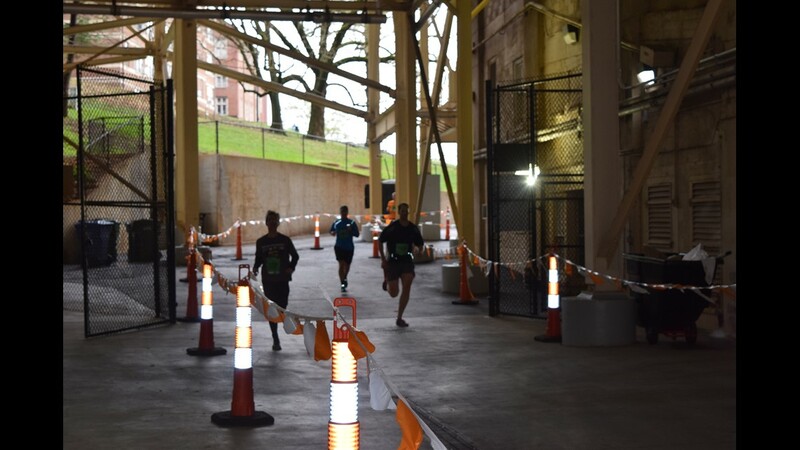 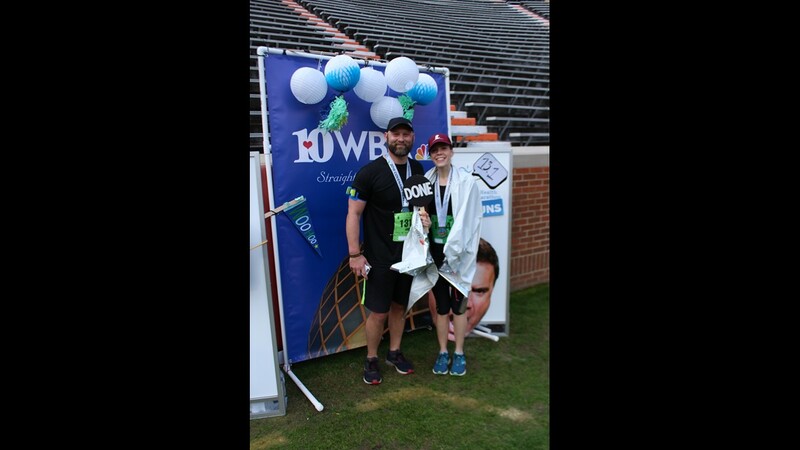 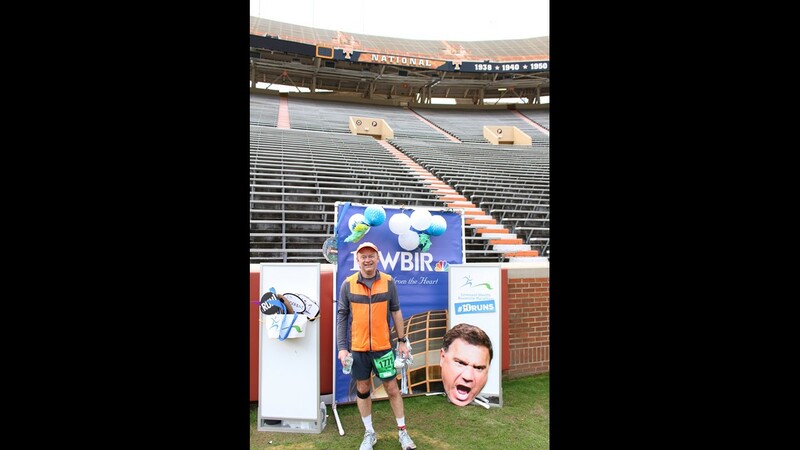 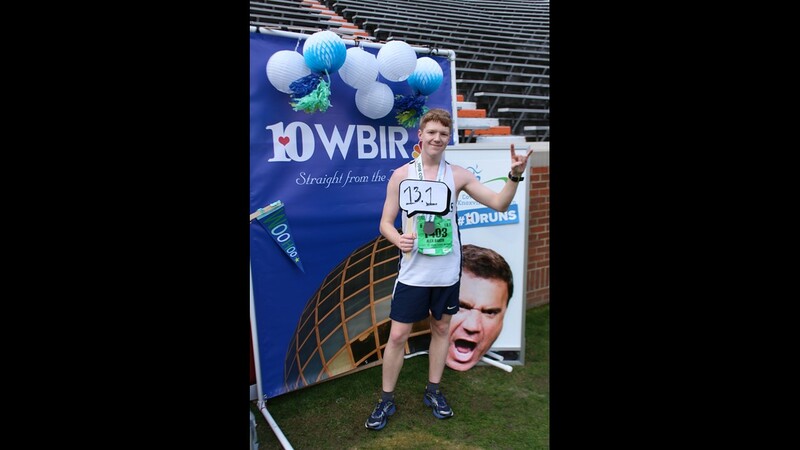 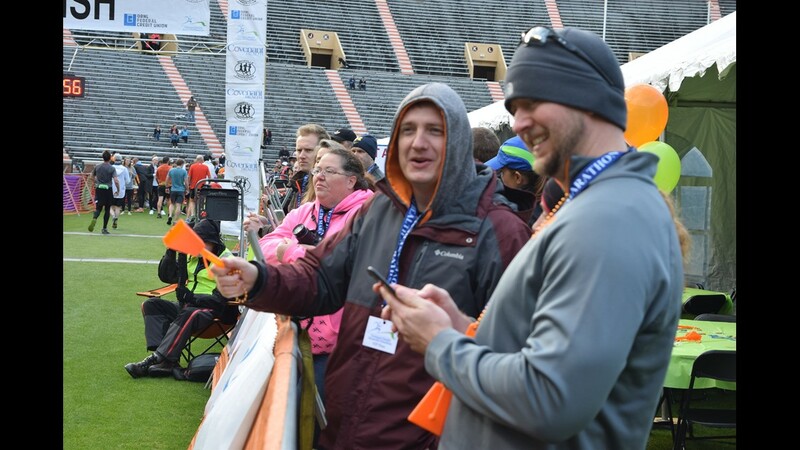 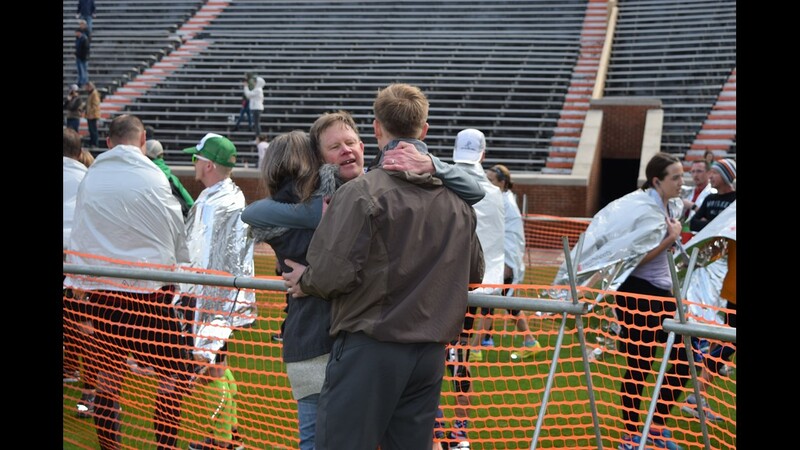 The first finishers in the half marathon crossed the finish line at Neyland Stadium roughly about an hour after the race began -- roughly finishing at 8:35. 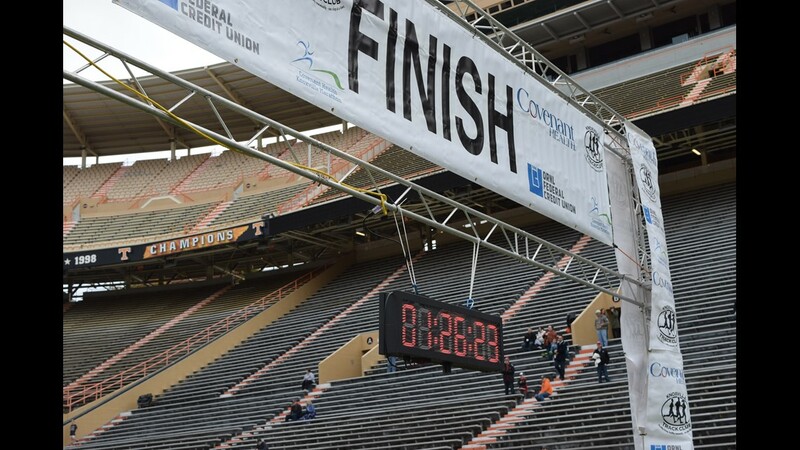 The full marathon runners started crossing over an hour later around 9:50 a.m. 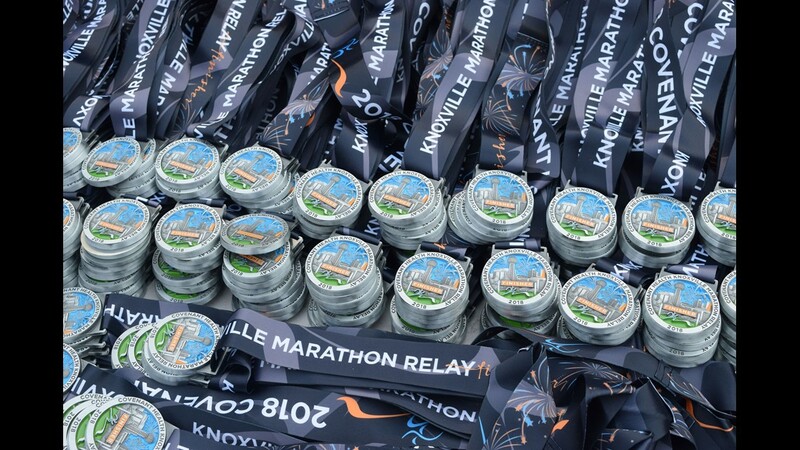 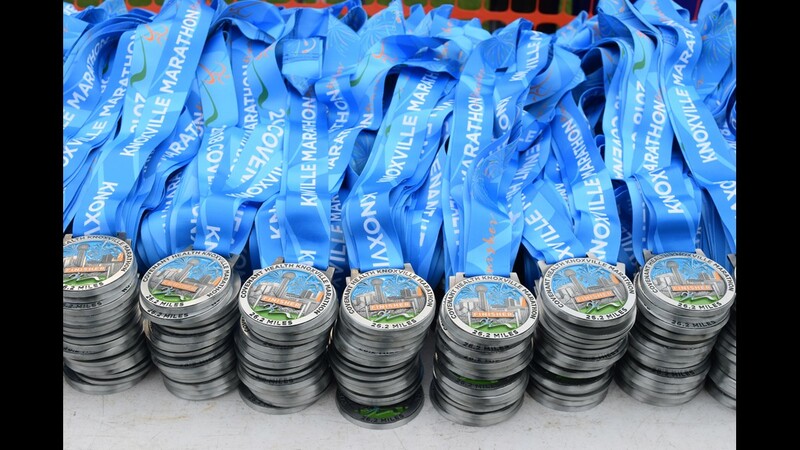 The male and female winners of the full marathon will each take home a nice $1,500 cash purse, and the half marathon winners will take home $500 each. 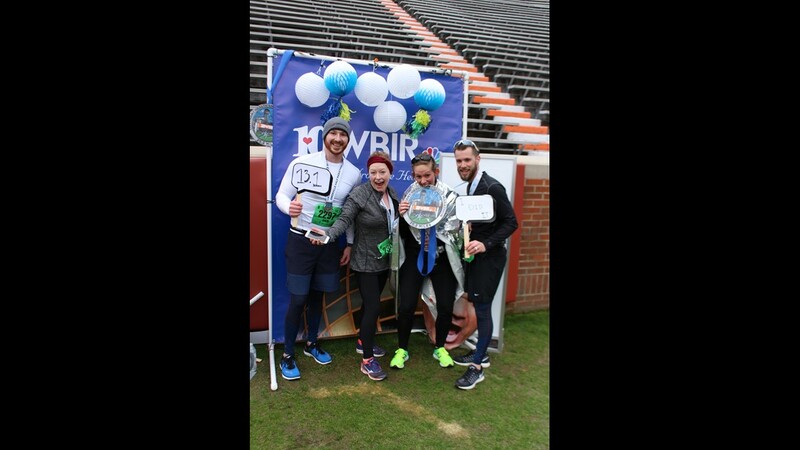 You can check out the total prize winnings here. 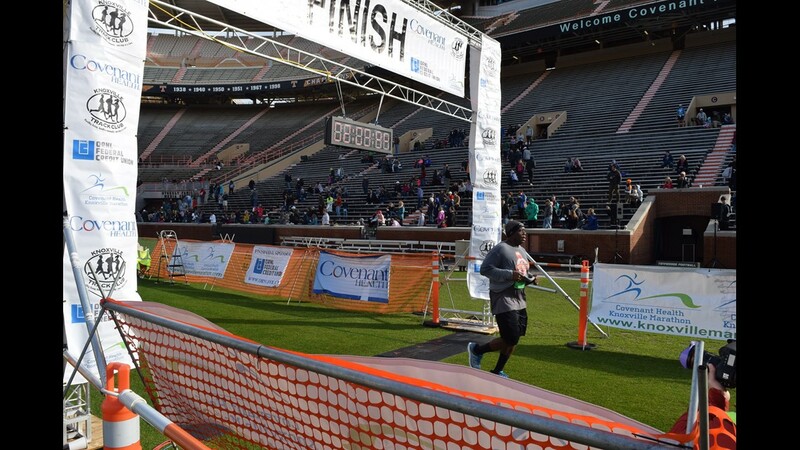 The weather this morning seems to be good for running. 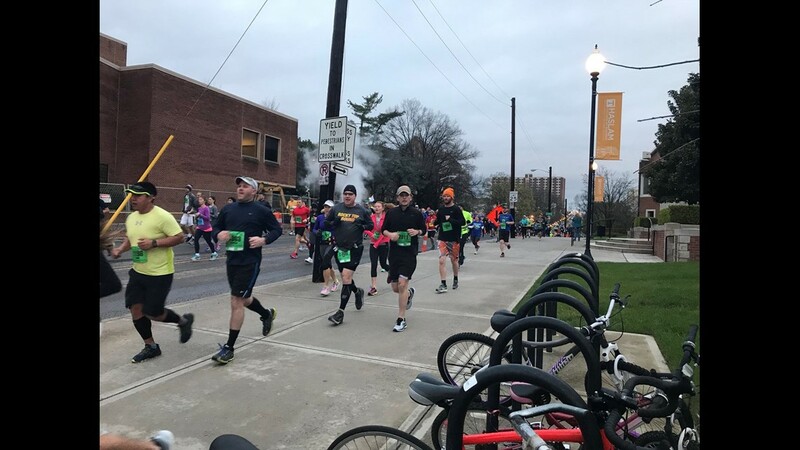 A few stray showers passed through early on, but the rest of the morning will be cloudy and cool with temps hovering in the mid and upper 40s for most of the marathon. 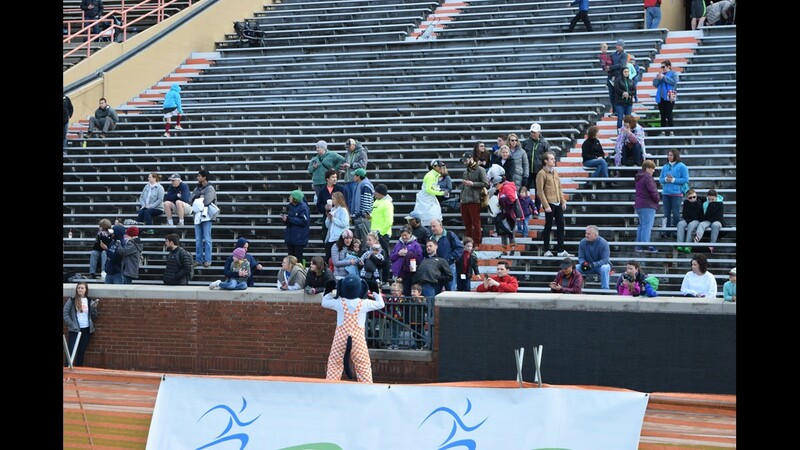 Definitely will want to bring a jacket or blanket if you're on the sidelines! 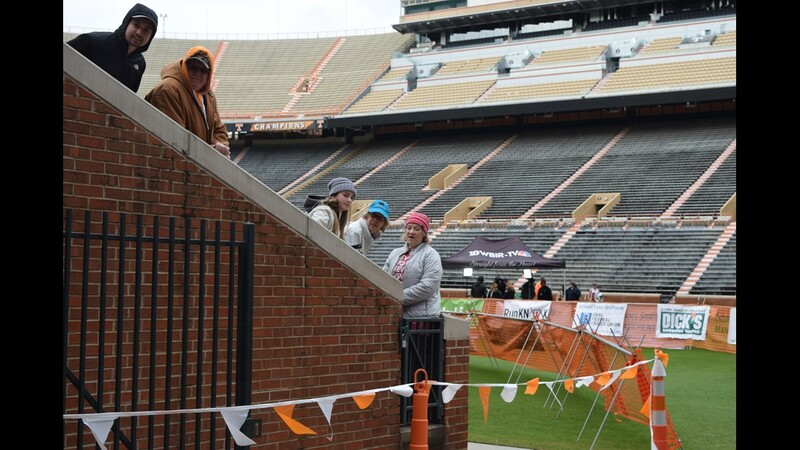 Things are set up for the 7:20 marathon step off! 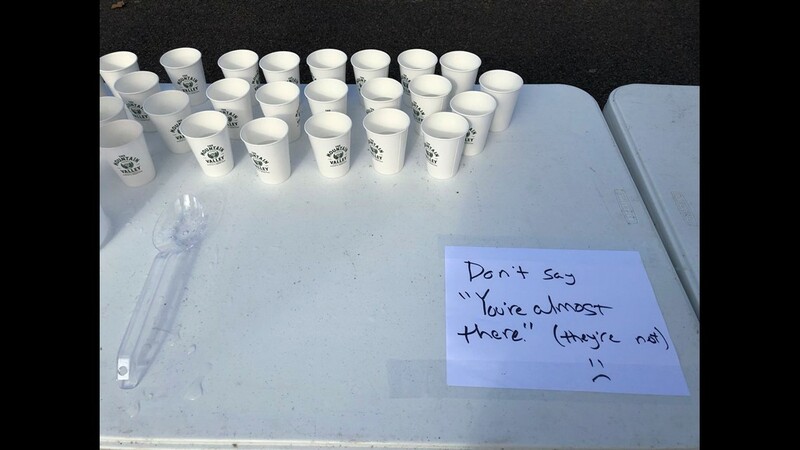 Volunteers are setting up to keep runners hydrated at water stations. 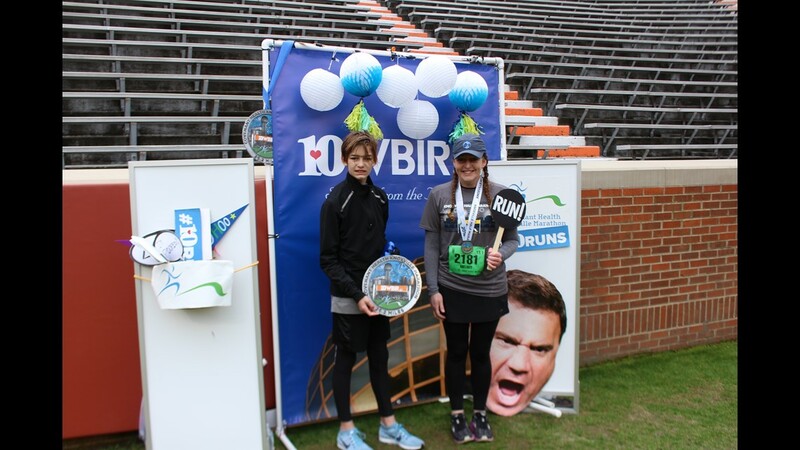 Check out some of the signs lining the race route! 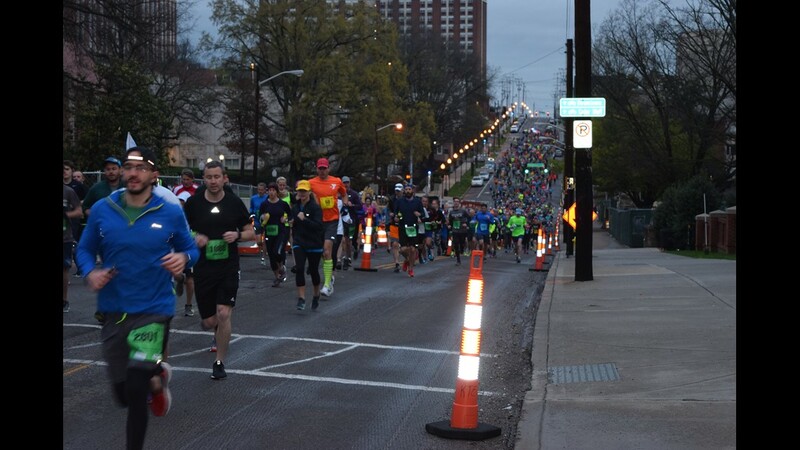 7:30 a.m.: The marathon is underway!Runners lined up for the opening ceremony. 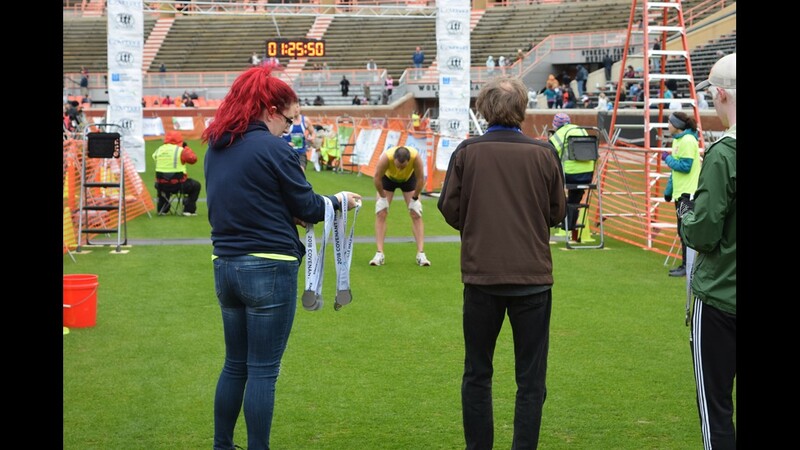 Four-time Boston Marathon winner and former world record holder Bill Rodgers wished runners luck before East Tennessee's own Emily Ann Roberts gave a perfect rendition of the Star-Spangled Banner.Runners then quickly took off down Clinch Avenue after the starting gun. 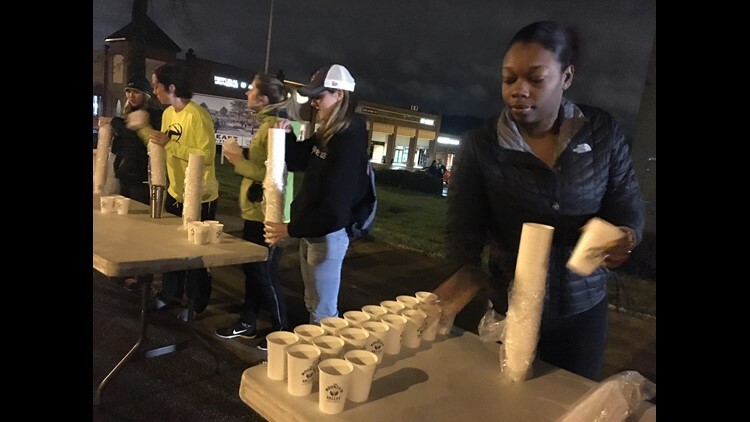 Check out how many of them are on the streets right now. 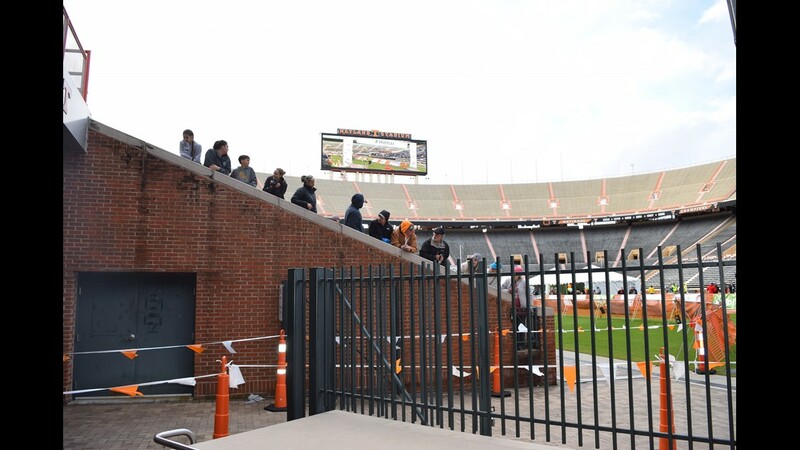 Who's up for some Rocky Top at 7 in the morning? 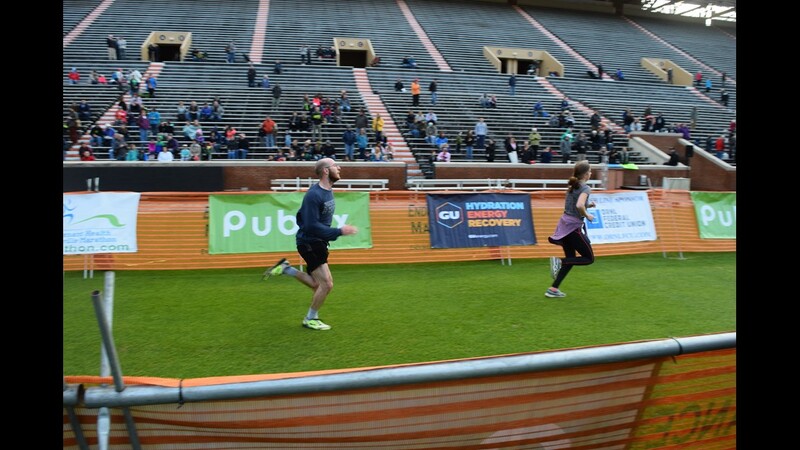 That's how you start a marathon in Knoxville! 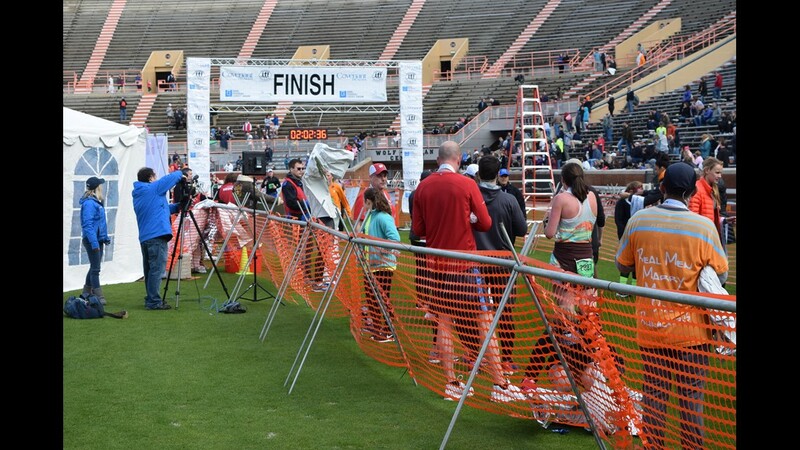 IIn case you've ever wondered what it takes to keep runners hydrated: for the 3,000 or so participating today: 1,300 gallons! 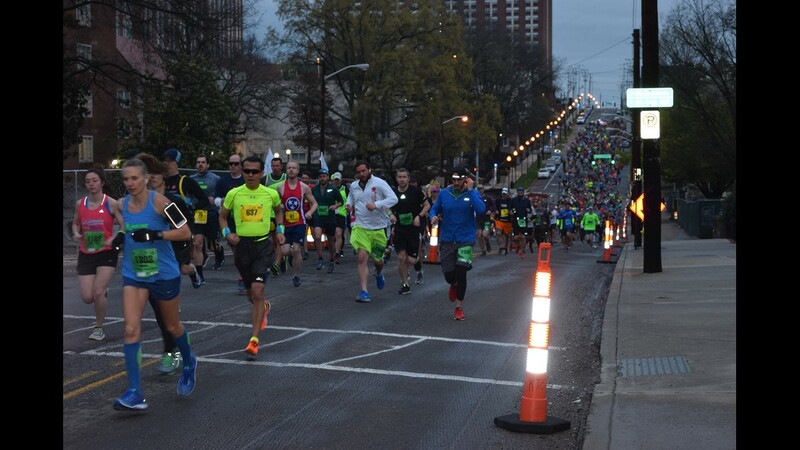 That's a lot of water!The first three runners in the half marathon passed the 3-mile mark aat Kingston Pike, and it's a close race between the three with the top two trading off. 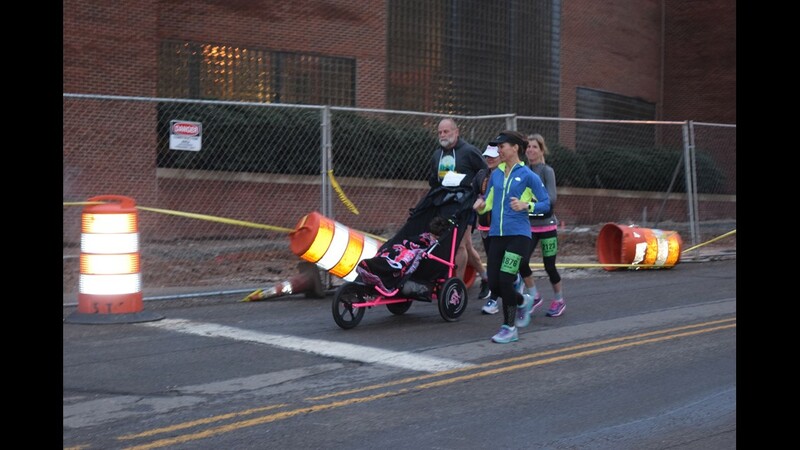 The folks running the half marathon are keeping a brisker pace and should finish around 8:40 a.m. 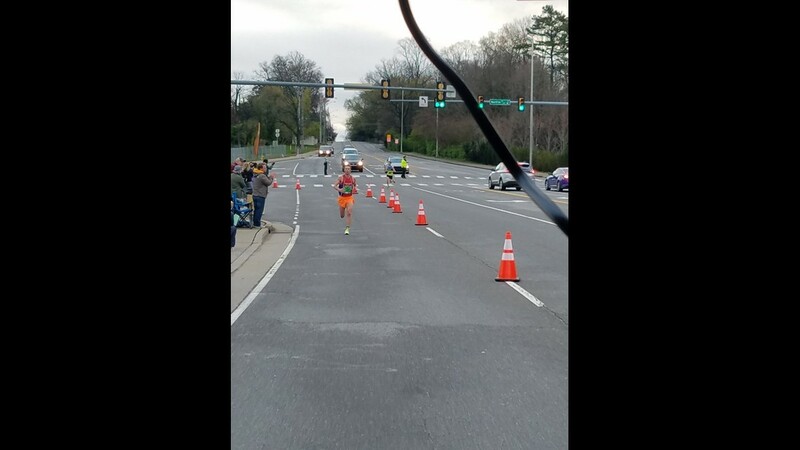 The leaders in the half marathon show no signs. 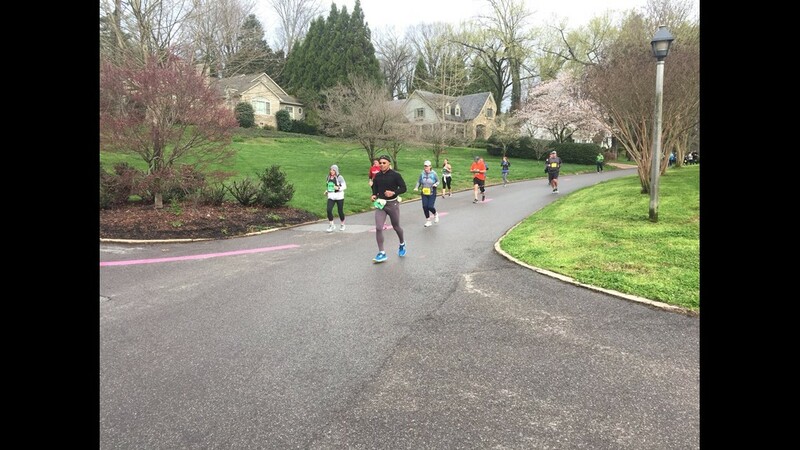 Christian Thompson and Jason McLeod traded off spots as they ran nearly side-by-side for the first leg heading around the Sequoyah Hills neighborhood. 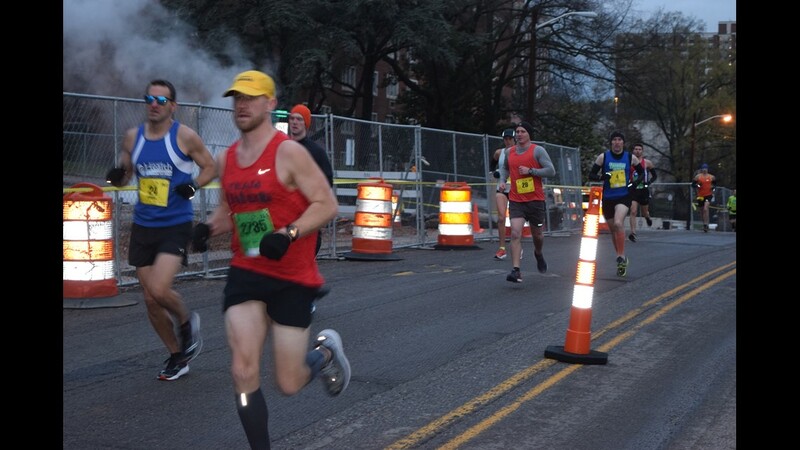 Behind them, 22-year-old Ben Tuttle held onto a solid third place lead. 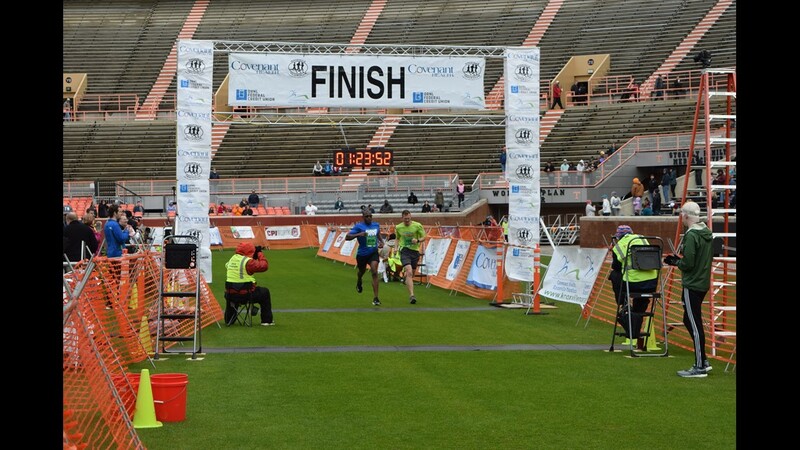 We have a winner at the half marathon! 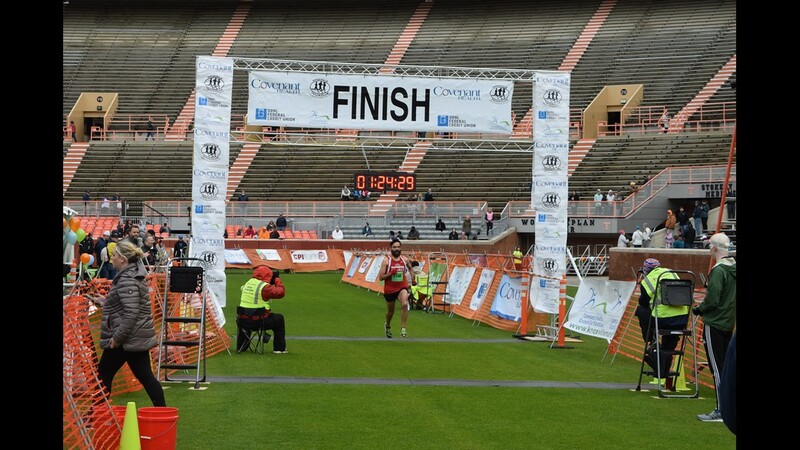 Christian Thompson has won the men's half marathon with an unofficial time of 1:09:48! 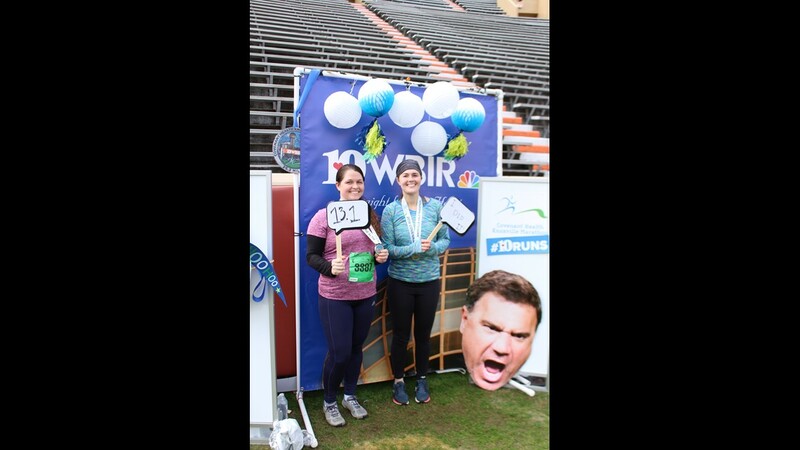 Definitely impressive for 13.1 miles! 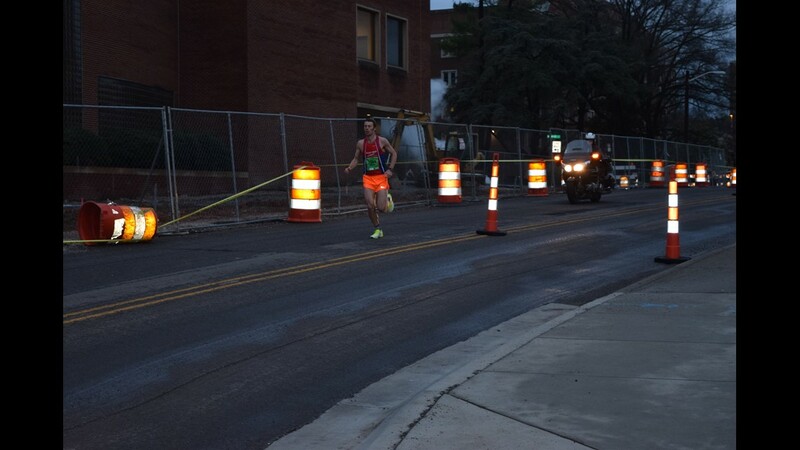 Jason McLeod was close behind and took second with a time of 1:10:12, and Ben Tuttle took third with 1:12:02. 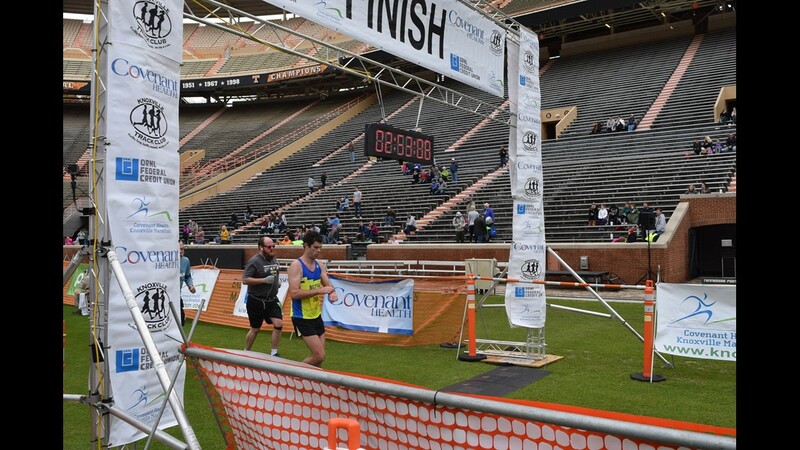 Full results can be found here. 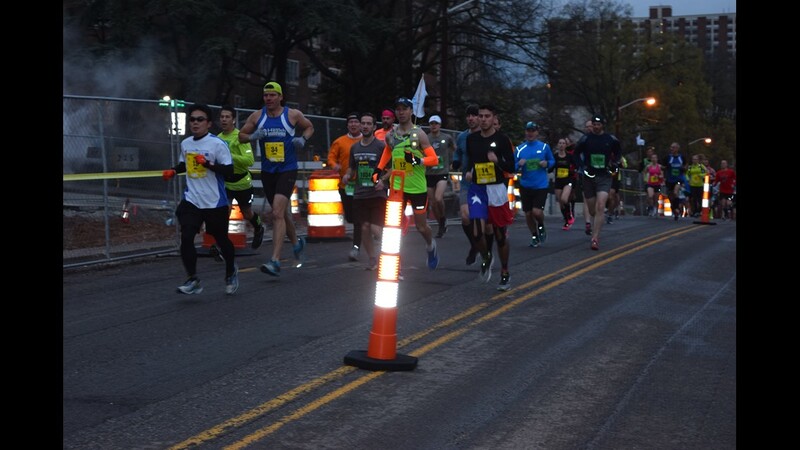 In the full marathon, the first three male leaders emerged in the pack. 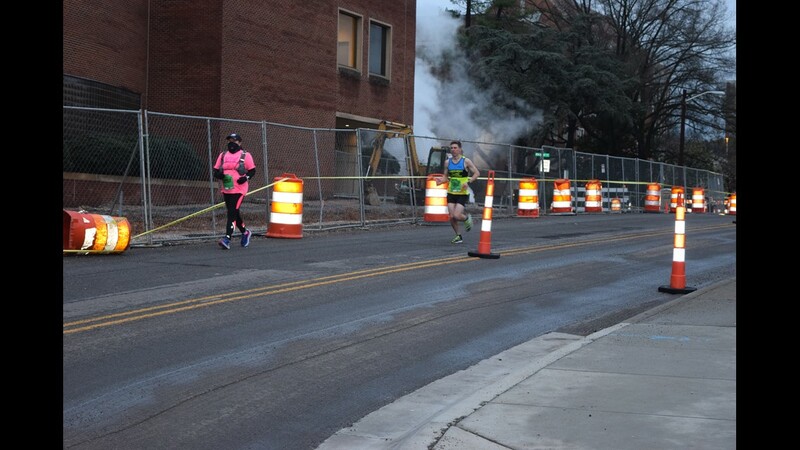 32-year-old Bryan Morseman was in the lead at the 1:14:00 mark with Edwin Letting and Ethan Coffey right behind. 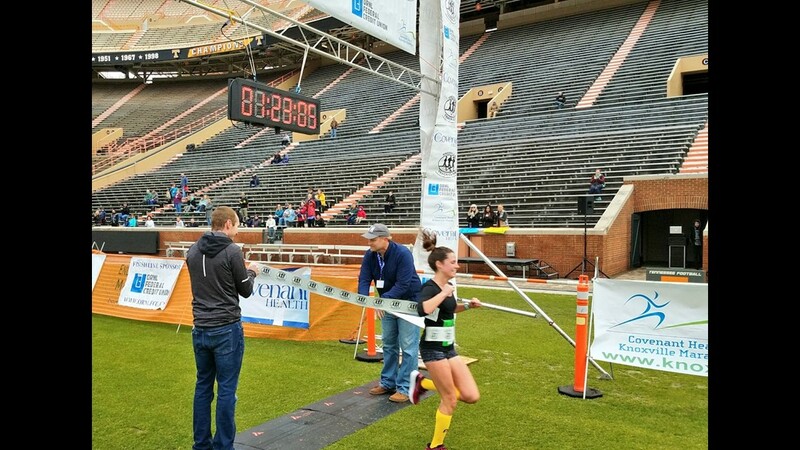 8:50 a.m.: 27-year-old Steph Cloutier from Wisconsin has won the women's half marathon with an unofficial time of 1:23:03! 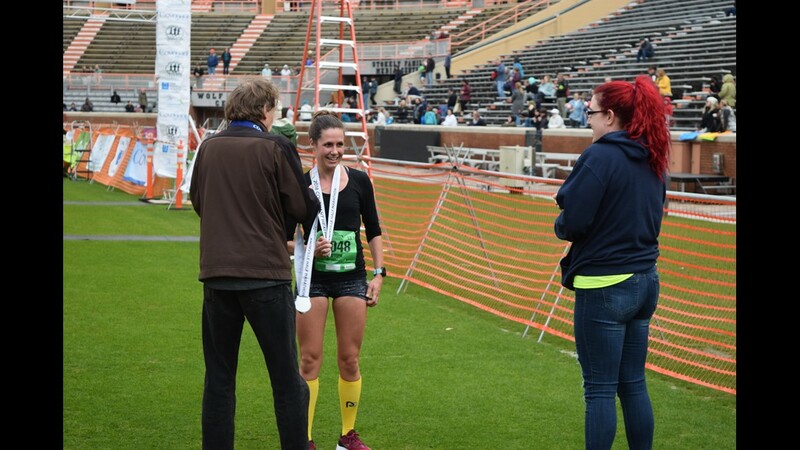 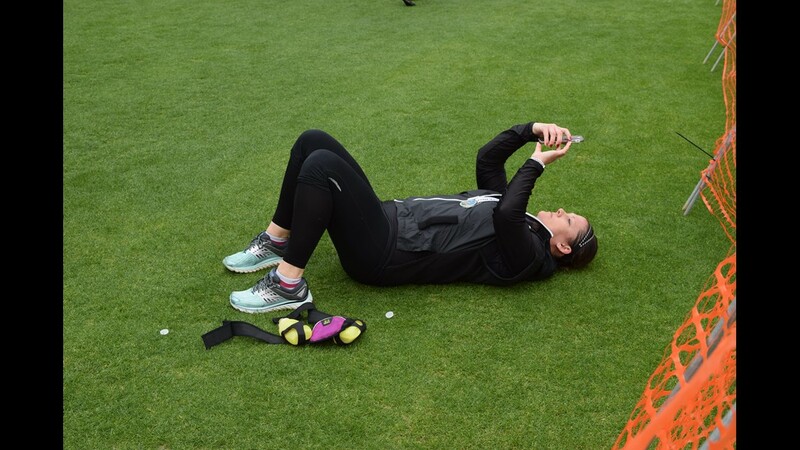 She says she's taking on the full marathon in Boston next -- good luck Steph!In second for the women's was 40-year-old Andee Swann with a time of 1:28:29, followed by Eliza Dickenson in third with a time of 1:32:01.9:00 a.m.:Bryan Morseman from New York is held on to the lead at the 1:14:00 mark, with Edwin Letting right behind and Ethan Coffey not too much farther behind.In the women's marathon, Gina Rouse was holding on to a solid 3:32 first-place lead ahead of Missy Showers, who is fighting in a close battle for second at the moment between Evan Adams and Johanna Butler. 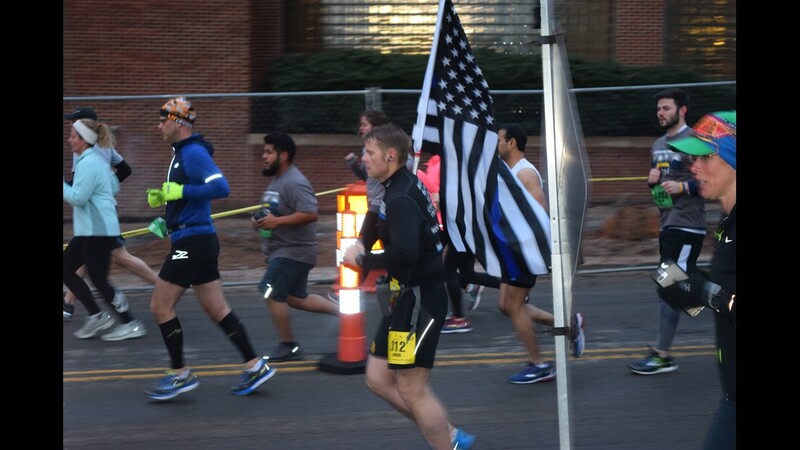 9:20 a.m.
Bryan Morseman continued to command a lead in the marathon as he passed through the 18 mile mark running through the Old City. 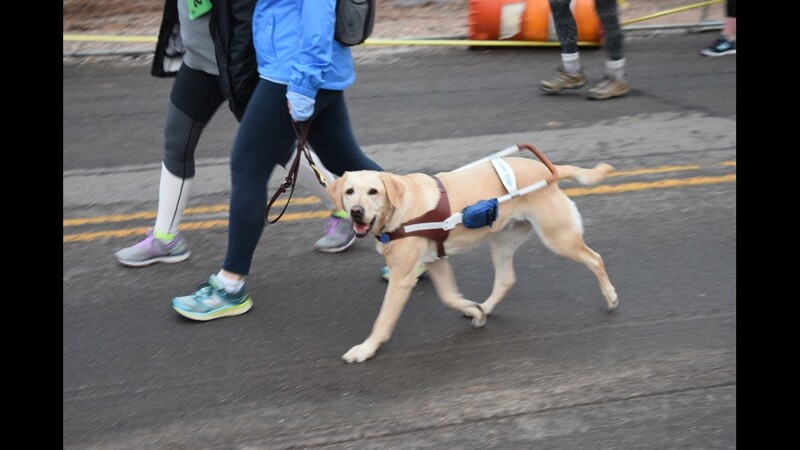 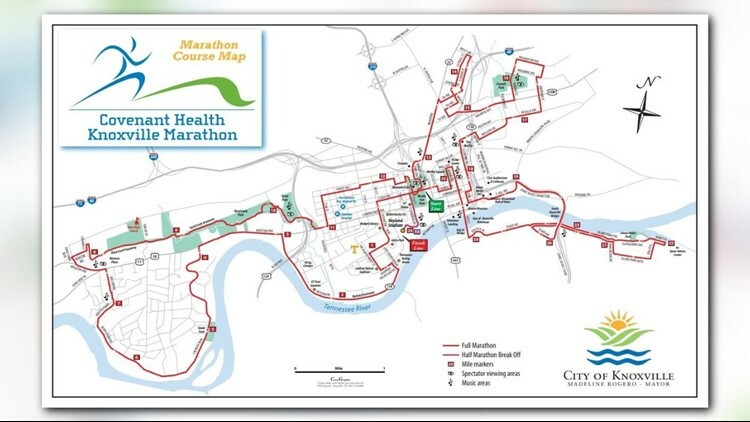 There is still plenty of running left -- the marathon will take him and other contenders hoping to finish all 26.2 miles across the river and around Island Home Park, before it takes them on a run for the Gay Street Bridge and into the final leg through the heart of downtown. 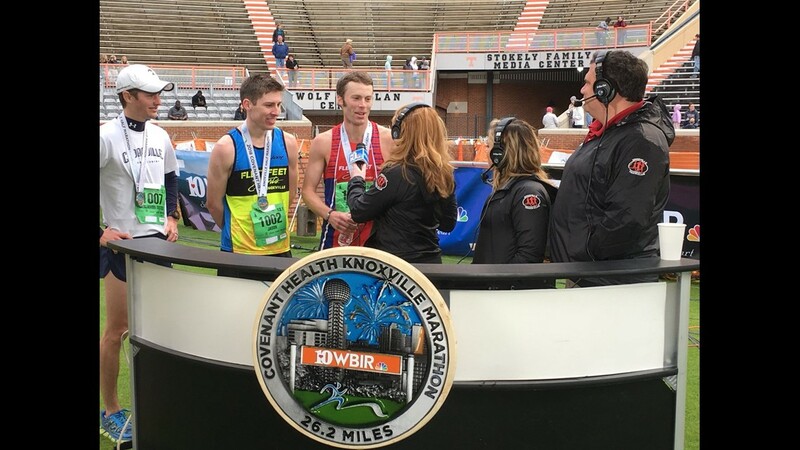 For the second time since his win in 2016, Bryan Morseman is the men's winner of the 2018 Covenant Health Knoxville Marathon with a time of 2:27:11. 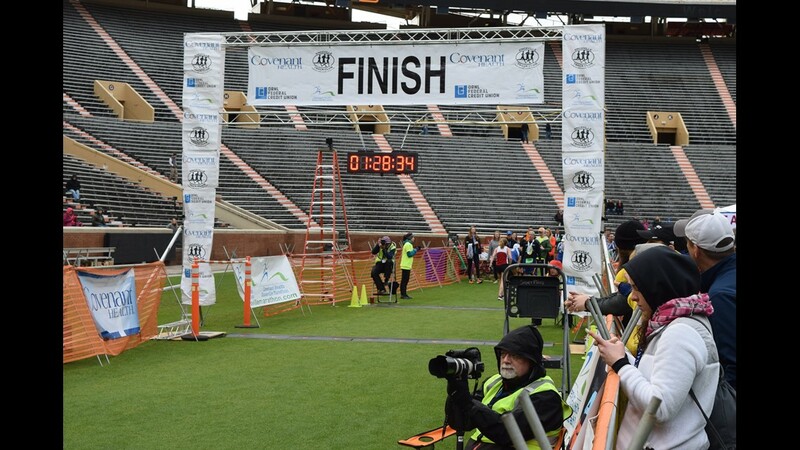 Ethan Coffey finished second with a time of 2:29:19. 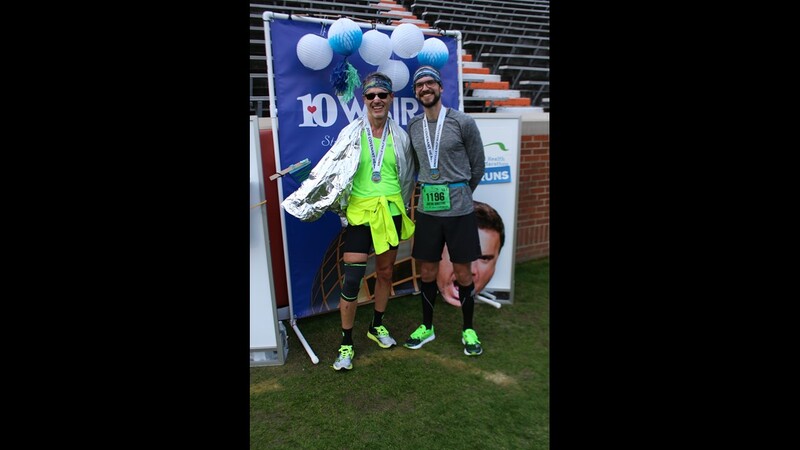 Congrats, Bryan and Ethan! Check the full results at this link. 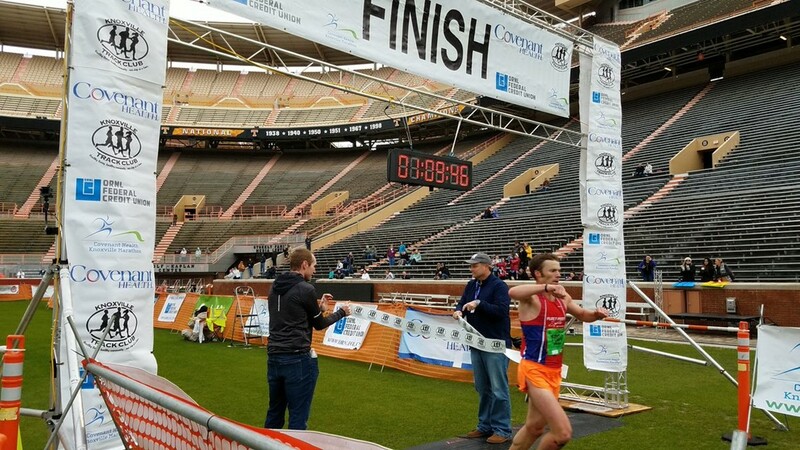 Gina Rouse pulled off the three-peat, winning yet another Covenant Health Knoxville Marathon with a time of 2:56:33! 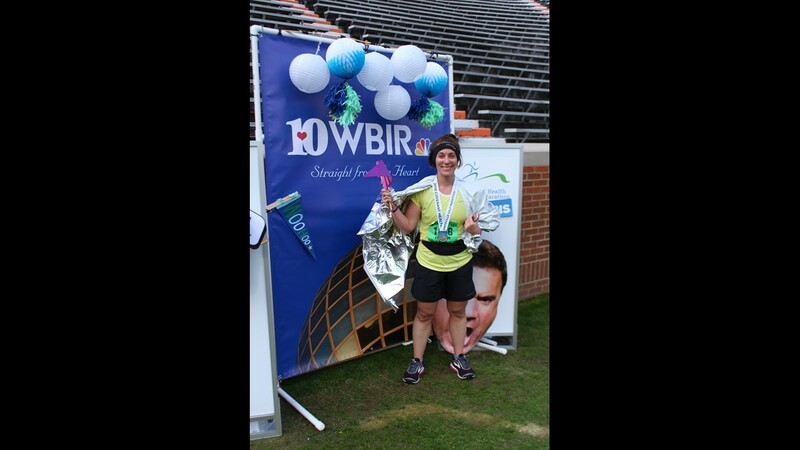 Congrats, Gina!